Here are some of the Deep Sky pictures that I have taken in the last 3 years. 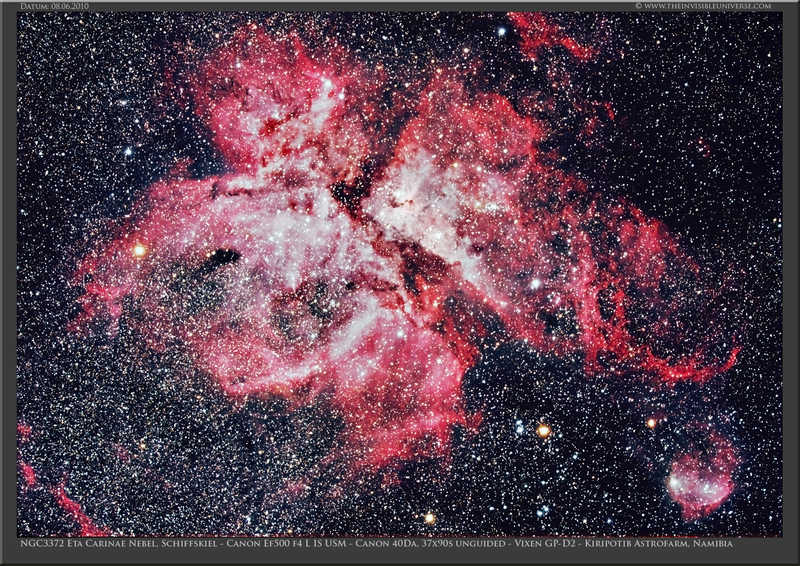 Of cause there are many Website in the Internet with far more sophisticated Deep Sky images than mine. Just take the pictures below as a proof that it is not necessary to spent your whole spare time or even quit your job to get some pretty astrophotos with your DSLR. 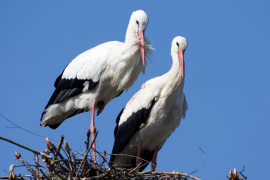 All pictures are either shot with unmodified Canon DSLRs (20D, 40D and 1D Mark III), a modified Canon 1000D or a cooled CCD camera with a Kodak KAF-8300 CCD chip (QHY9 or Moravian G2-8300). For me it is fascinating to shoot Deep Sky with my DSLR, which I also use for daylight photography. With a DSLR you can watch the results right after the shot on the camera monitor, just the way you do it for daylight shots. That gives a more...let say realistic impression, as I see the camera as an extension of my eye. 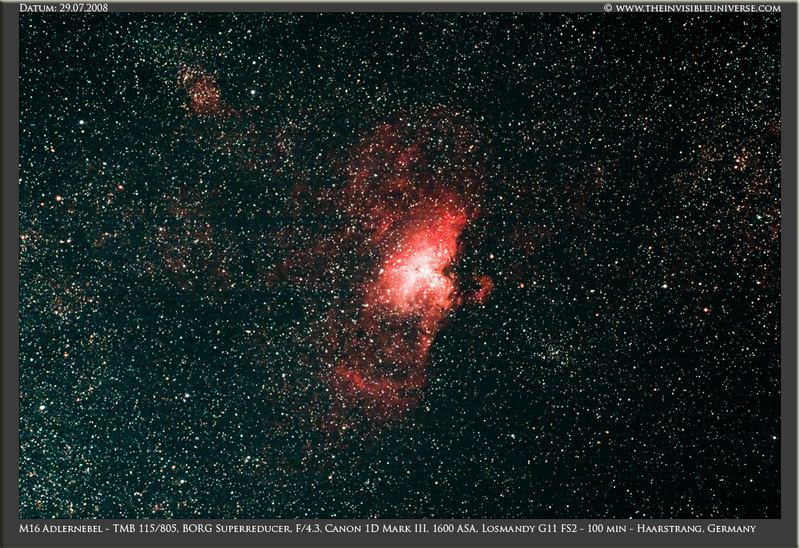 However, with a specialized astro CCD camera the results are a lot better in terms of noise and resolution. 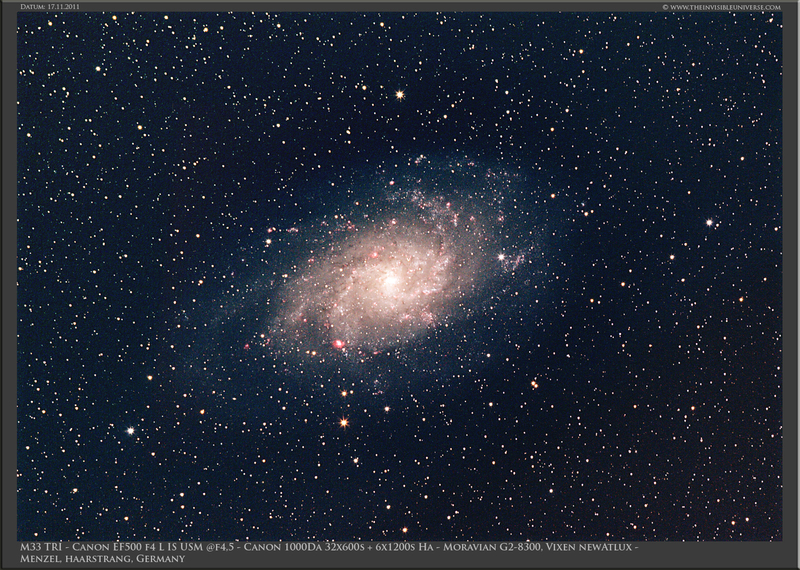 For a sky with heavy light pollution the results with a cooled CCD-camera are better than with a DSLR as the L-RGB image processing can eliminate the light pollution better and the cooling eliminates the thermal noise floor. For light polluted skies very long exposure times with a good S/N are essential to work out dim details of nebula and galaxies. From heavy light polluted areas like the Ruhrgebiet in Germany a good method to shoot pictures of dim nebula is narrow band imaging. I use a Moravian G2-8300 cooled CCD camera with a Baader LRGB Halpha OIII SII filter set. From my experience SII pictures are mostly very noisy and therefore I decided to use a bicolor technique to create a RGB image in Photoshop with a synthetic green channel as described in some pages on the web. However, with very long exposure times and an object in the Zenith it is possible to shoot pictures with a good S/N. The Heart Nebula IC1805 shows what is technically possible from a light polluted area. 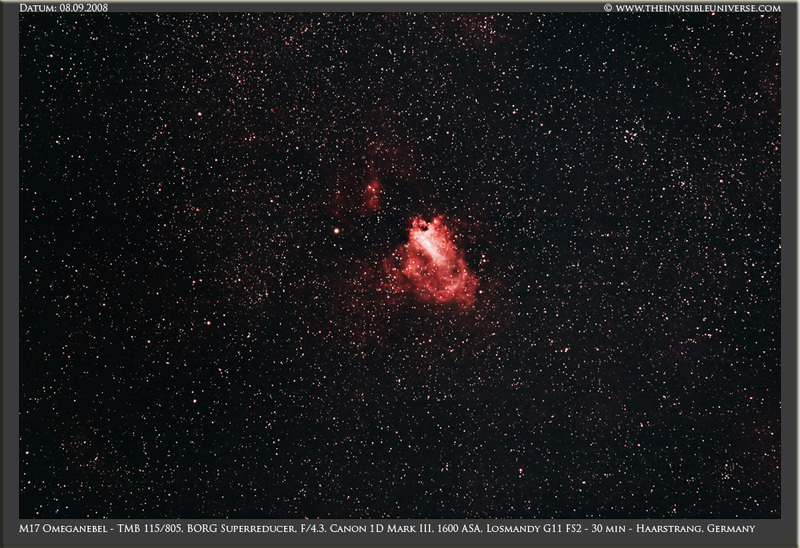 14 hours of exposure time with a modified Canon 1000D at 1600ASA and a UHC-S Filter combined with Halpha shots from the Moravian astro camera show stunning results that I have never expected from my location. 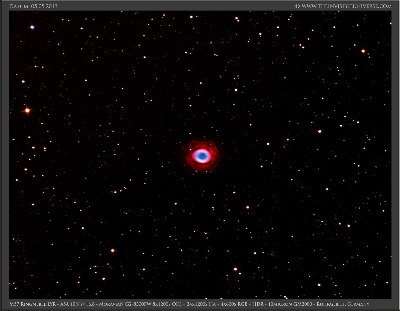 What you can see on Astro shots you will never see with your naked eye. This is the invisible universe getting visible through a camera! The optics I have used are described in the Equipment part of this website. However, after using Schmidt-Cassegrains for some times I have now concentrated on shorter focal length optics <1000mm, mainly apochromatic refractors, as long focal length systems make astrophotography difficult regarding guiding tolerances and differential flexing. I have learned that a very rigid mount with good guiding performance, a rigid and precise focusing unit with >3" diameter, and a very stable attachment of the guide scope to the main optics is essential for good results. Further the equipment must not be too heavy and bulky if one wants to escape the city lights and carry the whole equipment to a dark place. Link: see my astrophotos from Kiripotib Astrofarm in Namibia in 2010! The North America Nebula, NGC 7000, in the constellation of Cygnus is probably one of the most well know objects for astrophotography. Due to its size I decided to reactivate my TMB 115/805 APO refractor together with the BORG Superreducer to have fast a 500 mm f4.3 optics for my Moravian CCD camera. 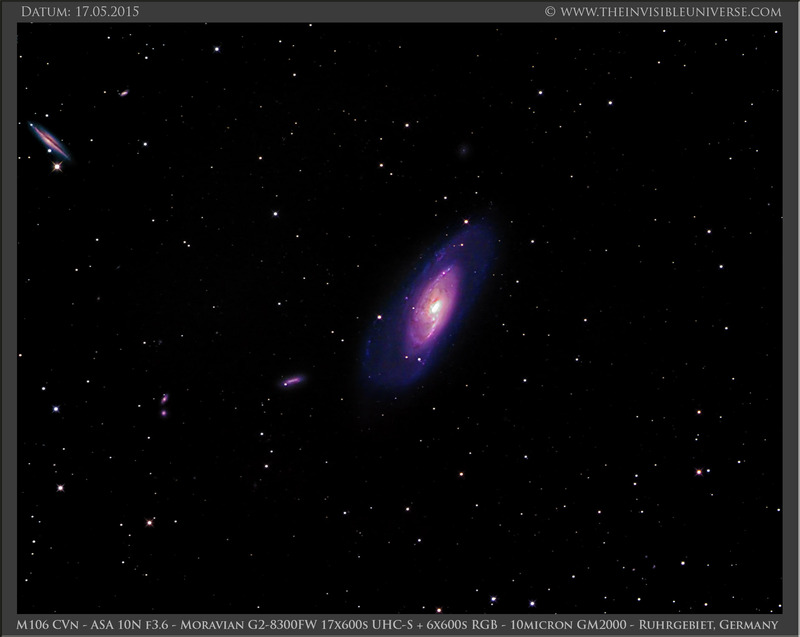 This is a version of my previous image of NGC7000 with additional SII data. In order to make an RGB image, I created two versions: one with SIIHaOII for RGB and one with OIIISIIHa for RGB. I mixed those two palattes to create this colored version of the North America Nebula. Ha: 12x1200s 1x1, OIII: 16x1200s 1x1; SII: 19x1200s 1x1; RGB: 6x360s each. 16h of total exposure time. Baader 2" CCD-Filter. TMB 115/805 Apochromatic Refractor with Carbon Tube and BORG f4.3 Superreducer. 10micron GM2000. Guiding with a self made off-axis guider for the ASA Wynne-Corrector and a Starlight XPress Lodestar. Moravian G2-8300FW cooled CCD camera. Location: Ruhrgebiet, Germany. This is a quick Panorama of the entire Milkyway as seen from Namibia in June 2014. 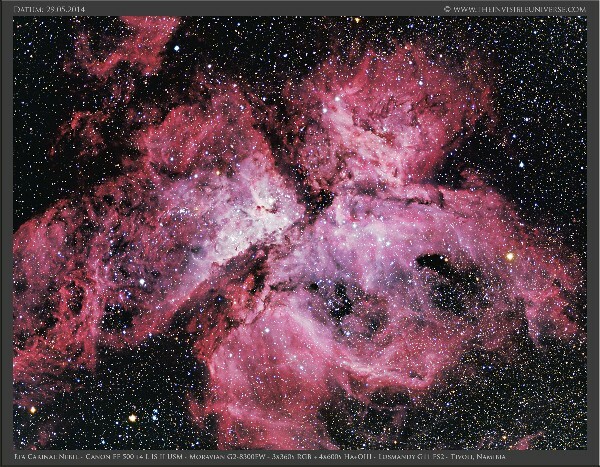 Five single 20s frames shot with the Canon 1DX at ISO25600 were stiched together. The panorama shows the Milkyway from the east to the west horizon. At the horizon you can see two observatories of the astro farm Tivoli. Click here to go to a bigger version of the panorama. 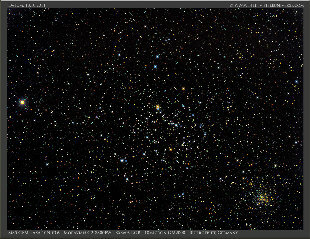 The open double star cluster h&chi Persei in the constellation Perseus. 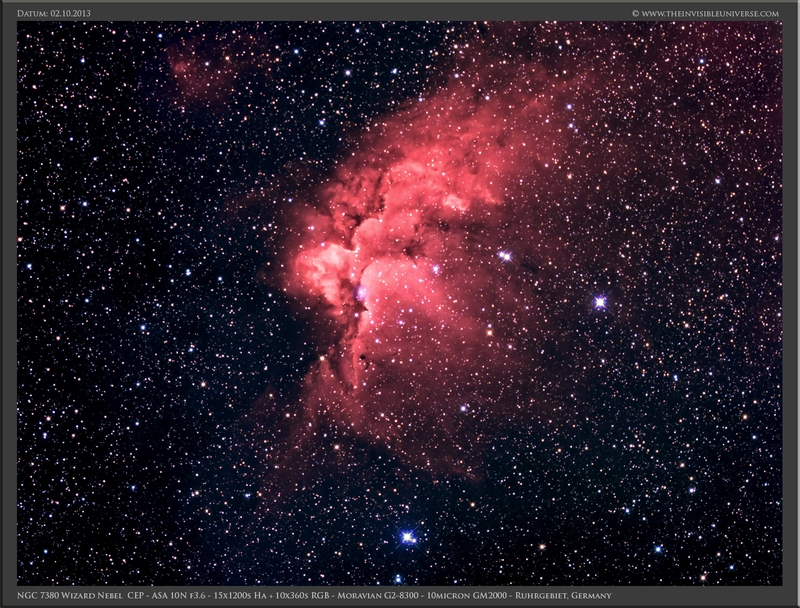 RGB: 5x360s 1x1, Baader 2" CCD-Filter. TMB 115/805 with BORG superreducer @f4.3. 10micron GM2000 mount. Guiding with a self made off-axis guider for the Wynne-Corrector and a Starlight XPress Lodestar. Moravian G2-8300FW cooled CCD camera. Location: Ruhrgebiet, Germany. 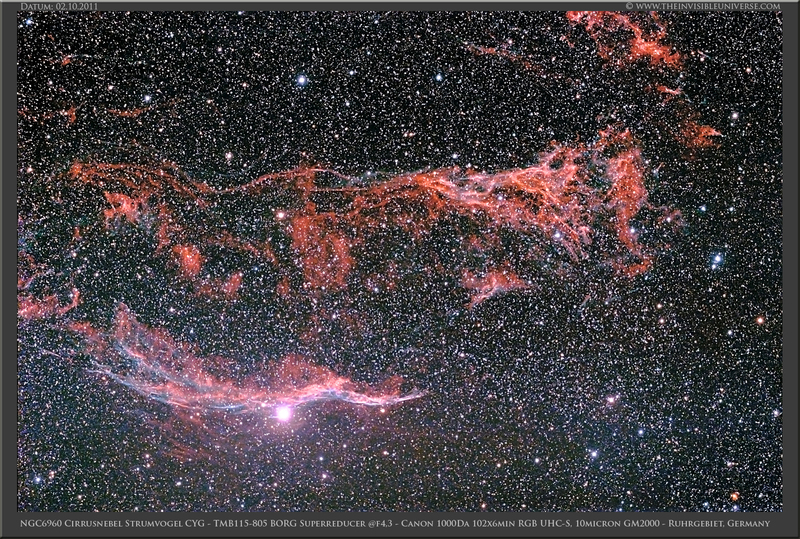 This is a part of the large supernova remnant Simeis 147 at the border of the constellations Auriga and Taurus. The 500mm focal length of the TMB APO with the BORG super reducer are too much to allow a total view of this large emission nebula. 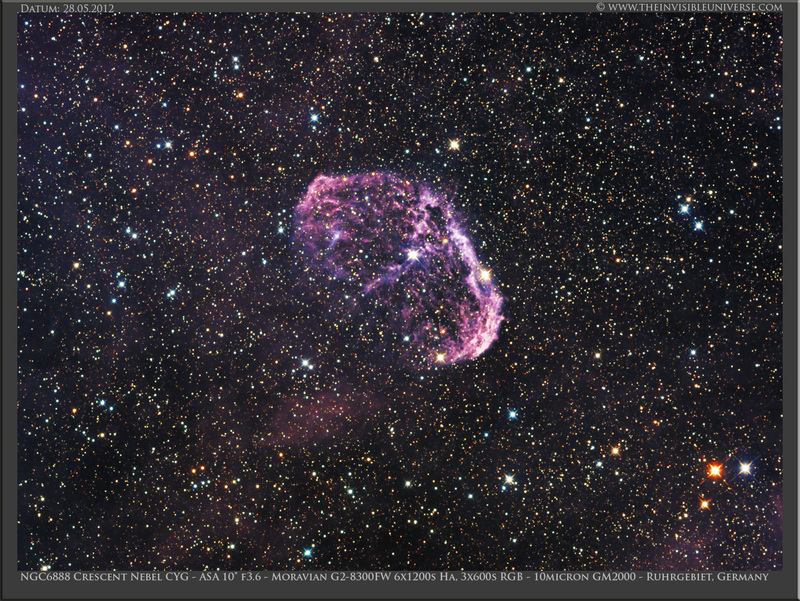 I wish I had the opportunity to shoot this nice object under very dark sky. Narrowband: 19x1200s for Ha=red. 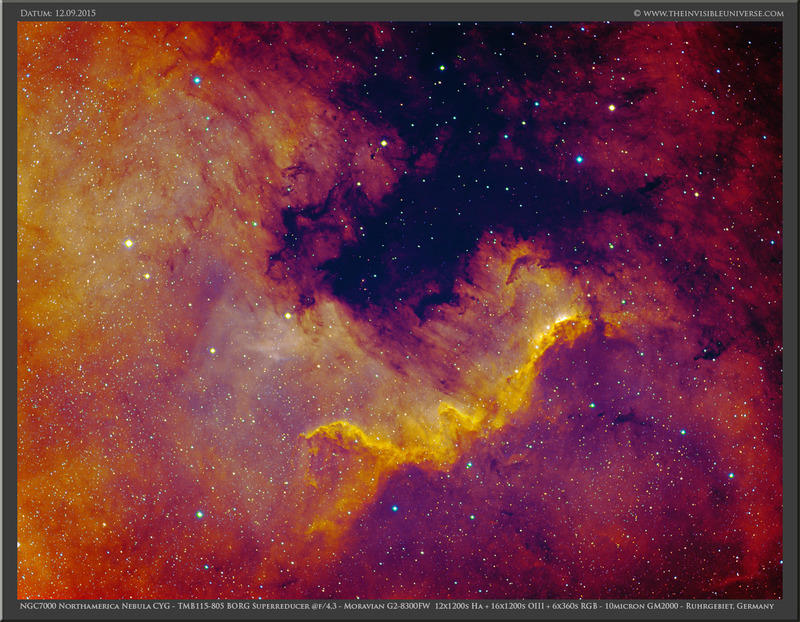 RGB: 5x360s 1x1, Baader 2" CCD-Filter. TMB 115/805 with BORG superreducer @f4.3. 10micron GM2000 mount. Guiding with a self made off-axis guider for the Wynne-Corrector and a Starlight XPress Lodestar. Moravian G2-8300FW cooled CCD camera. Location: Ruhrgebiet, Germany. The famous Rosetta Nebula NGC2239 in the constellation of Monoceros, a very nice emission nebula and open star cluster of the winter milky way. 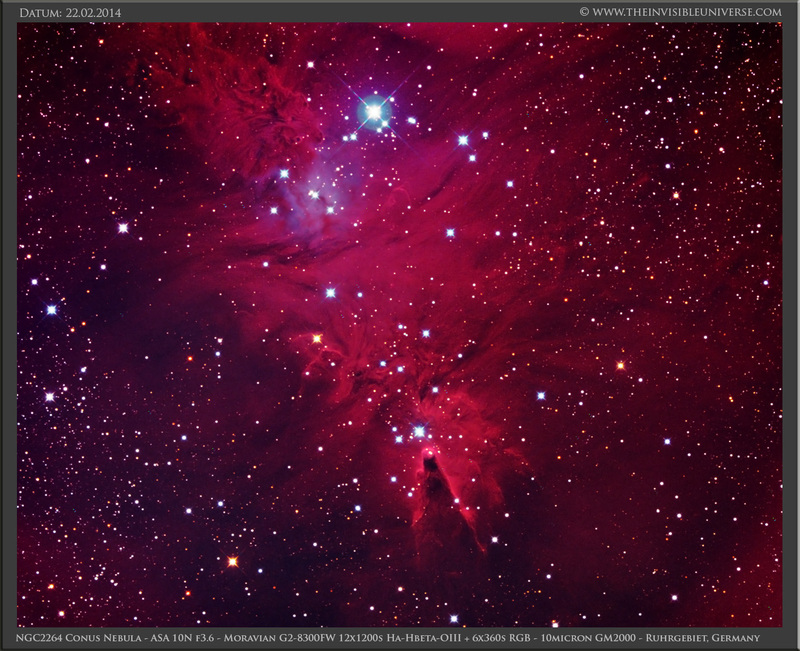 I combined 10x1200s each for Ha=red, SII=green and OIII=blue for this color composite. The S/N of SII is not very good; hence the main signal contributors are the Ha and OIII emission regions. Looking to the South from my Observatory means looking directly into the light polluted Ruhrgebiet. Only the brightest stars of Orion are visible with the naked eye. 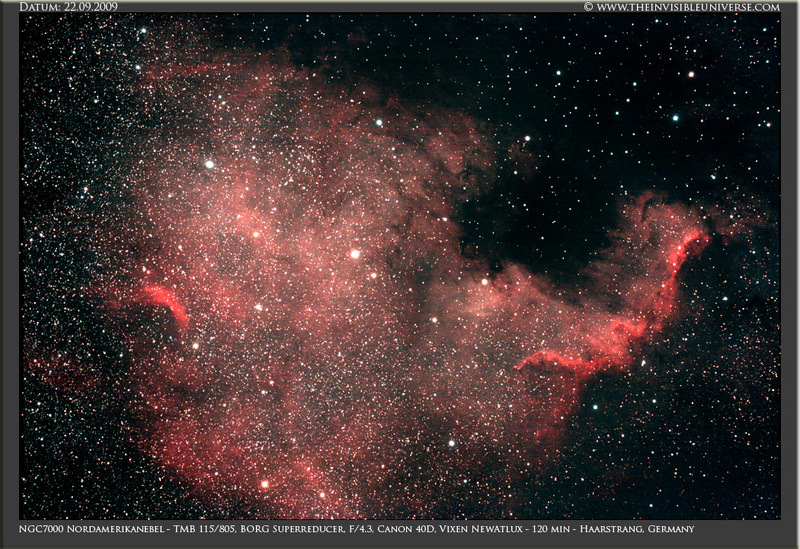 It is a wonder that this nebula appears on theCCD-chip at all! Narrowband: 10x1200s for Ha=red, SII=green and OIII=blue. 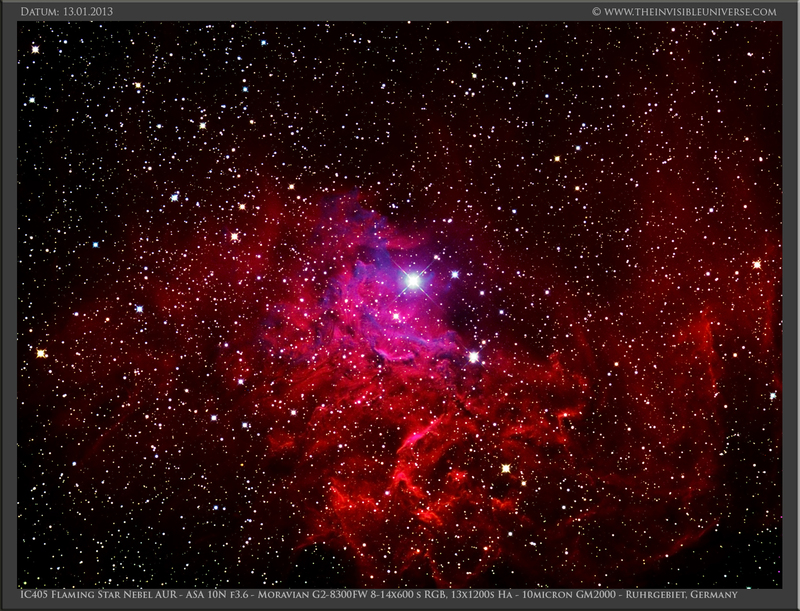 RGB: 10x360s 1x1, Baader 2" CCD-Filter. TMB 115/805 with BORG superreducer @f4.3. 10micron GM2000 mount. Guiding with a self made off-axis guider for the Wynne-Corrector and a Starlight XPress Lodestar. Moravian G2-8300FW cooled CCD camera. Location: Ruhrgebiet, Germany. M100 in the constellation of Coma Berenices is a nice galaxy of the spring sky. It is part of the outer region of the virgo galaxy cluster and the brightest spiral galaxy of this group of galaxies. 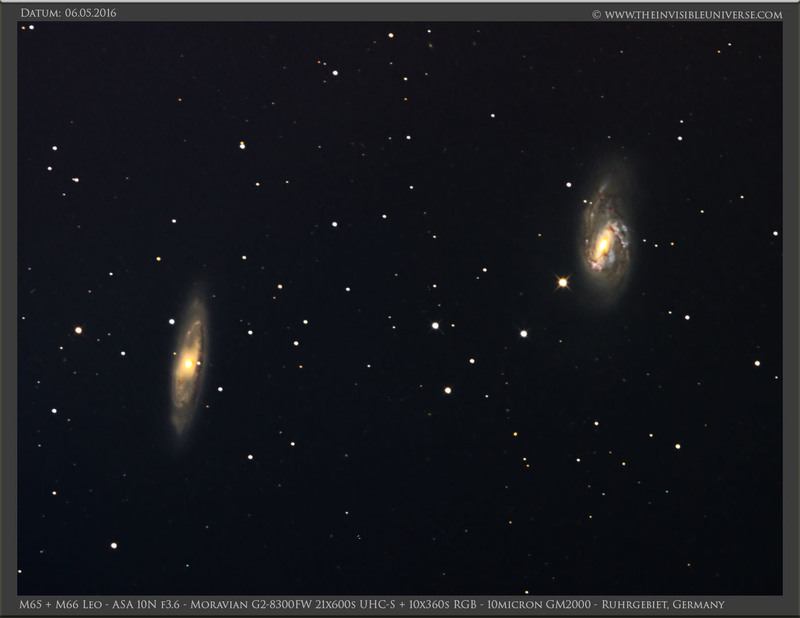 Unfrotunately shooting galaxies in urban areas is not very satisfying due to the bright sky background and the lack of usable narrowband signal. 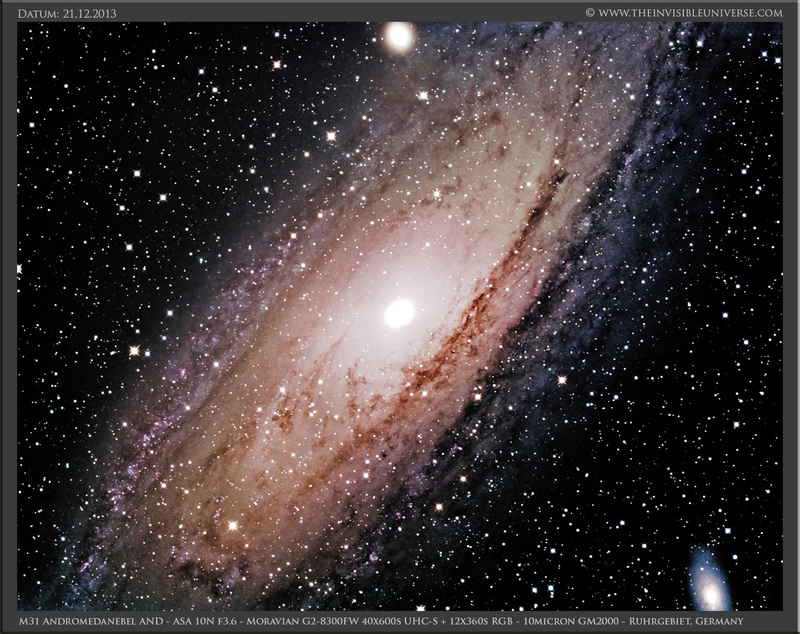 Luminance: 19x600s UHC-S, RGB: 10x360s 1x1, Baader 2" CCD-Filter. ASA 10N, f=910mm at f3.6. 10micron GM2000 mount. Guiding with a self made off-axis guider for the Wynne-Corrector and a Starlight XPress Lodestar. Moravian G2-8300FW cooled CCD camera. Location: Ruhrgebiet, Germany. The two Galaxies M65 and M66 in the constellation Leo are part of the Leo-triplett. In contrast to my first version with 90 min exposure time I spent a lot more time in image integration with a total of 370 min. Unfortunately the end result does not show significantly more detail due to the bright sky background. 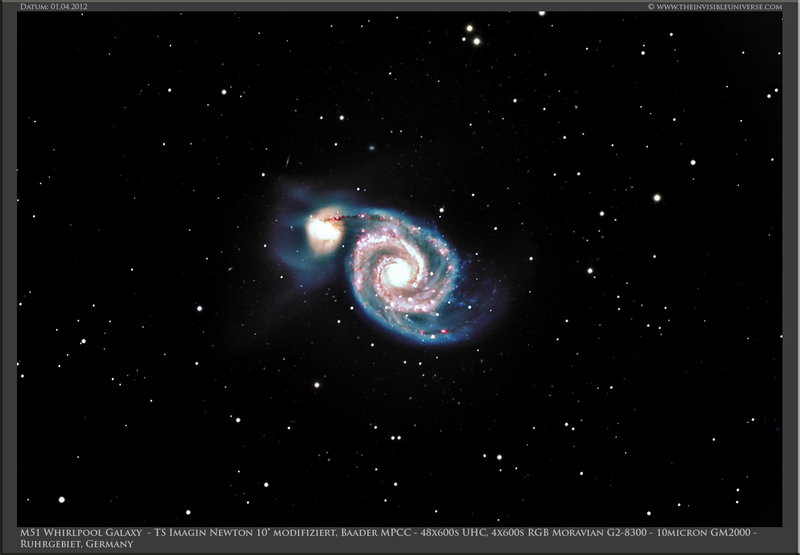 Shooting galaxies in urban areas is a hassle. 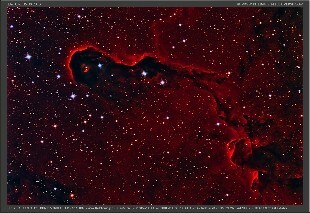 Luminance: 21x600s UHC-S, RGB: 10x360s 1x1, Baader 2" CCD-Filter. ASA 10N, f=910mm at f3.6. 10micron GM2000 mount. Guiding with a self made off-axis guider for the Wynne-Corrector and a Starlight XPress Lodestar. Moravian G2-8300FW cooled CCD camera. Location: Ruhrgebiet, Germany. 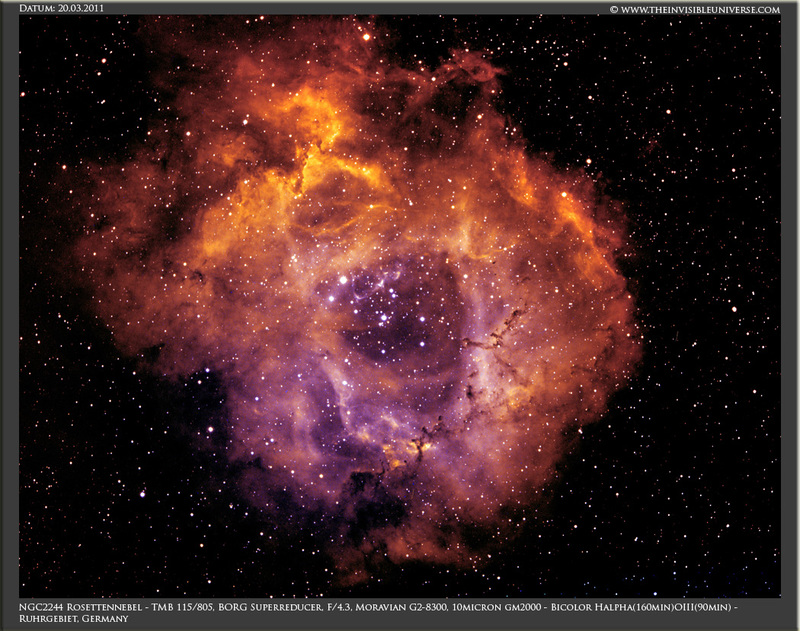 Another revisit of a former photography project: IC410, also called the tadpole nebula in the constellation of Auriga. 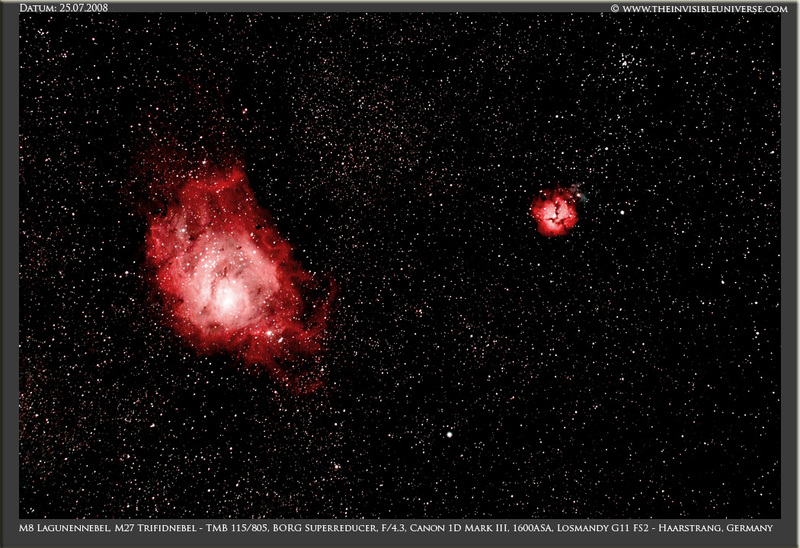 I added SII to the Ha and OIII frames, enhanced by RGB frames for star coulors. 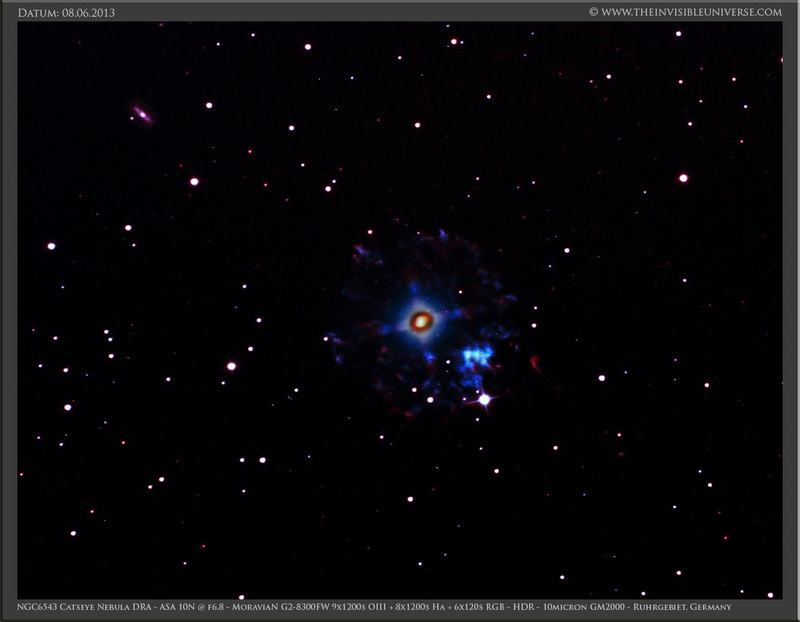 I used the modified Hubble palette with Ha=red, SII=green and OII=blue. Dealing with the dim and noisy SII channel is really difficult. Ha: 19x1200s 1x1, OIII 19x1200s 1x1, 9x1200s SII 1x1, RGB: 3x360s each. Baader 2" CCD-Filter. ASA 10N Astrograph, 910mm at f3.6. 10micron GM2000. Guiding with a self made off-axis guider for the Wynne-Corrector and a Starlight XPress Lodestar. Moravian G2-8300FW cooled CCD camera. Location: Ruhrgebiet, Germany. The North America Nebula, NGC 7000, in the constellation Cygnus is probably one of the most well know objects for astrophotography. Due to its size I decided to reactivate my TMB 115/805 APO refractor together with the BORG Superreducer to have fast a 500 mm f4.3 optics for my Moravian CCD camera. As I am still missing a SII narrow band filter, I shot this picture in Ha-OIII Bicolor narrow band technique and enhanced the star colors with some RGB frames. Ha: 12x1200s 1x1, OIII: 16x1200s 1x1; RGB: 6x360s each. 11h of total exposure time. Baader 2" CCD-Filter. TMB 115/805 Apochromatic Refractor with Carbon Tube and BORG f4.3 Superreducer. 10micron GM2000. Guiding with a self made off-axis guider for the ASA Wynne-Corrector and a Starlight XPress Lodestar. Moravian G2-8300FW cooled CCD camera. Location: Ruhrgebiet, Germany. The base image is made by narrowband bicolor image processing and creating a synthetic green channel with OIII+Ha data. However, I have changed the color of the OIII emission to create a more blueish hue. Furthermore, I tried to catch the dim outer regions of the nebula, as well as the Ha emission of the ionized gas in the Cygnus cloud. Ha: 20x1200s 1x1, OIII: 14x1200s 1x1; RGB: 7x600s each. 14h of total exposure time. Baader 2" CCD-Filter. ASA 10N Astrograph, 910mm at f3.6. 10micron GM2000. Guiding with a self made off-axis guider for the Wynne-Corrector and a Starlight XPress Lodestar. Moravian G2-8300FW cooled CCD camera. Location: Ruhrgebiet, Germany. 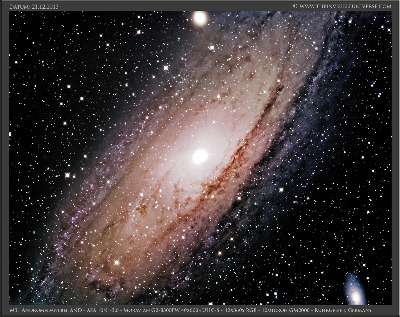 The Andromeda Galaxy M31 again. I already collected a lot of data last year, but now I have nearly doubled the amount of data and integration time to a whopping 17 hours! However, image processing was even more complicated than in the first version one year ago. It took me quite a long time to find an acceptable version. Despite the long integration time, the dim outer regions of the galaxy are drown in the bright sky background of the city lights. For the inner very bright core of M31 it is very difficult to prevent a burn out of the image and simultaneously maintain a realistic color. I used the HDR filter, high pass filtering and unsharp masking to enhance the structures of the galaxy, and an additional colored layer to reduce the green hue of the uneven sky background. Luminance UHC-S 89x600s 1x1, RGB: 21x360s each. 17h of total exposure time. Baader 2" CCD-Filter. ASA 10N Astrograph, 910mm at f3.6. 10micron GM2000. Guiding with a self made off-axis guider for the Wynne-Corrector and a Starlight XPress Lodestar. Moravian G2-8300FW cooled CCD camera. Location: Ruhrgebiet, Germany. 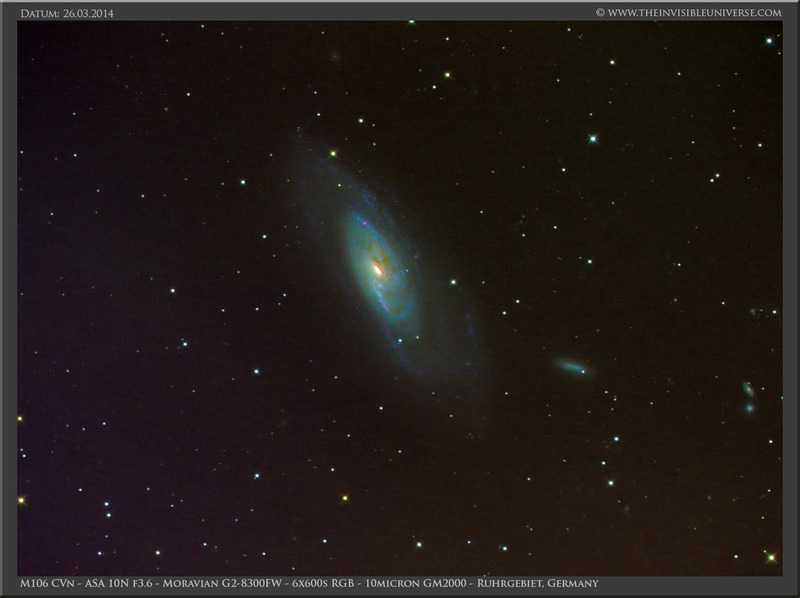 Another reloaded version: M106 in Canes Venatici. This is a star burst galaxy of the Hubble type Sbp in 24 My LJ distance. Many young new born stars are creating a bluish glow of the spiral arms. This version contains almost 2x the exposure time of my first preliminary version. 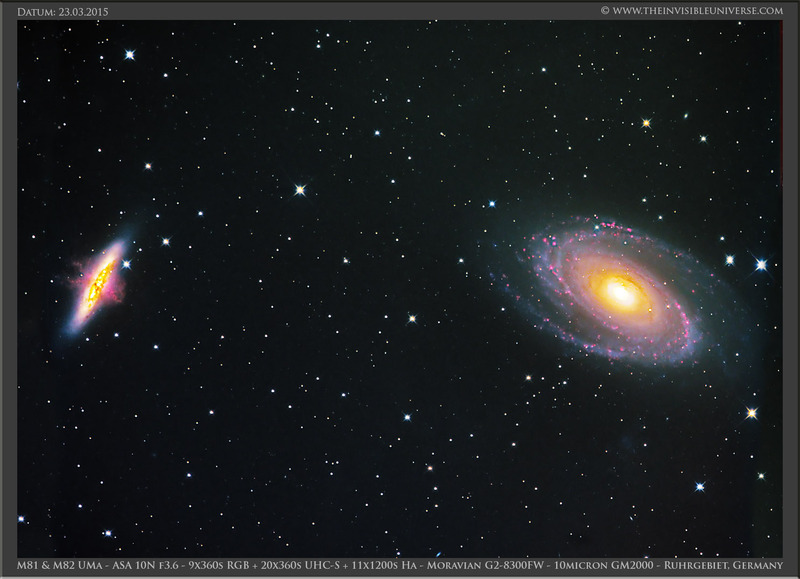 Furthermore I changed the color composition of the central core of the galaxy to a more bluish tint. 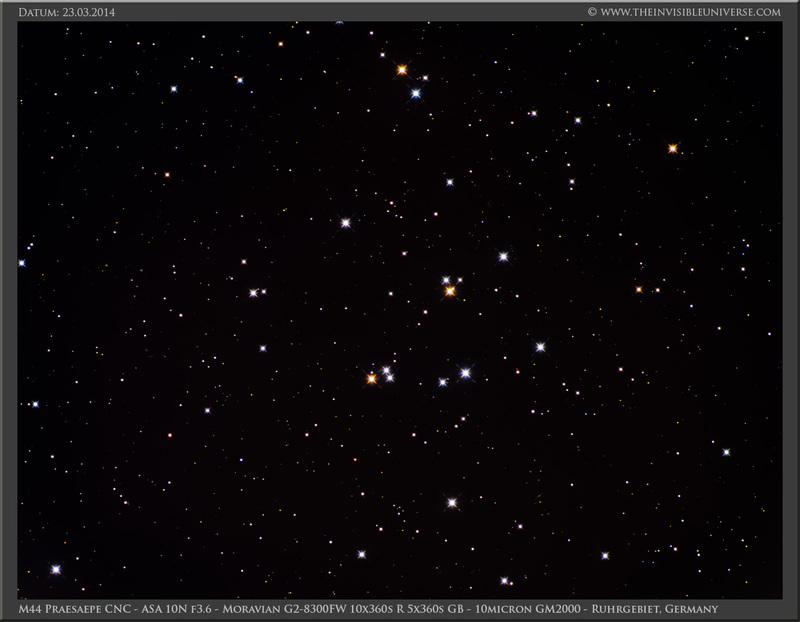 UHC-S: 17x600s; RGB: 6x600s 1x1, Baader 2" CCD-Filter. ASA 10N, f=910mm at f3.6. 10micron GM2000 mount. Guiding with a self made off-axis guider for the Wynne-Corrector and a Starlight XPress Lodestar. Moravian G2-8300FW cooled CCD camera. Location: Ruhrgebiet, Germany. 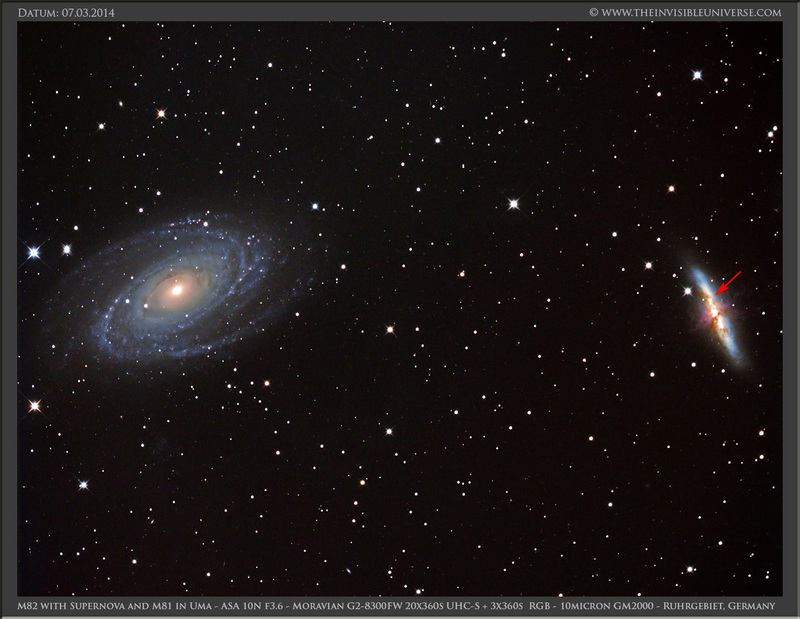 Here is a second version of my image of M81 and M82 in Ursa Major with longer exposure times in RGB and an additional Halpha channel for enhancing the red structures in M82. The total integration time is about 10 hours. 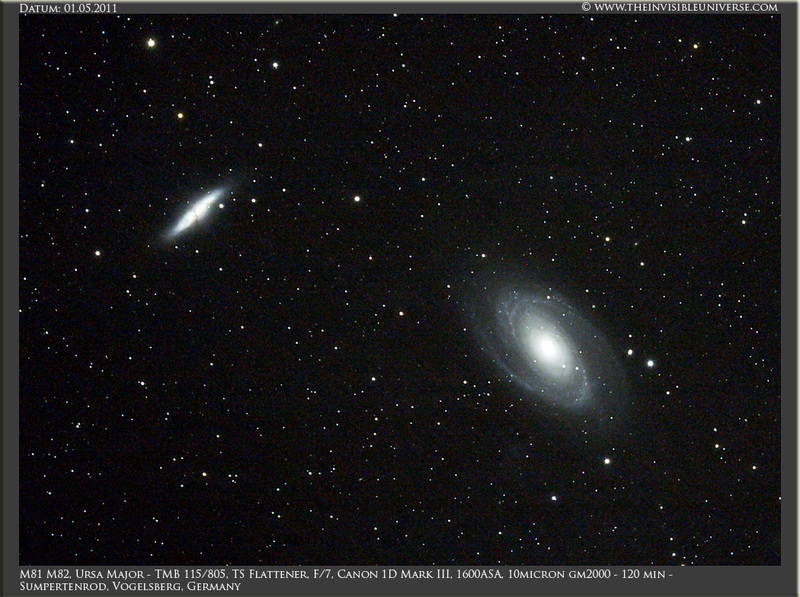 In my first picture of this Galaxy pair in March 2014 a supernova was visible in M82. This image contains data from March 2014 and March 2015. UHC: 20x360s 1x1, RGB: 9x360s each, Ha: 11x1200s. Baader 2" CCD-Filter. ASA 10N Astrograph, 910mm at f3.6. 10micron GM2000. Guiding with a self made off-axis guider for the Wynne-Corrector and a Starlight XPress Lodestar. Moravian G2-8300FW cooled CCD camera. Location: Ruhrgebiet, Germany. M106 in Canes Venatici. This is a star burst galaxy of the Hubble type Sbp in 24 My LJ distance. Many young new born stars are creating a bluish glow of the spiral arms. I did not spend much integration time due to bad weather. Longer exposure times are objective for future work. Furthermore I was fighting with the green sky background of the street lights during image processing. It is hard to achieve a neutral sky background without compromising the colour of the galaxy. RGB: 6x600s 1x1, Baader 2" CCD-Filter. ASA 10N, f=910mm at f3.6. 10micron GM2000 mount. Guiding with a self made off-axis guider for the Wynne-Corrector and a Starlight XPress Lodestar. Moravian G2-8300FW cooled CCD camera. Location: Ruhrgebiet, Germany. The two Galaxies M65 and M66 in the constellation Leo are part of the Leo-triplett. 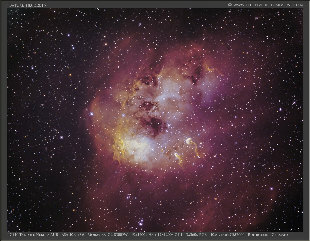 NGC3628 is not visible in the field of view of the ASA Astrograph. I did not spend much integration time due to bad weather. Longer exposure times are objective for future work. 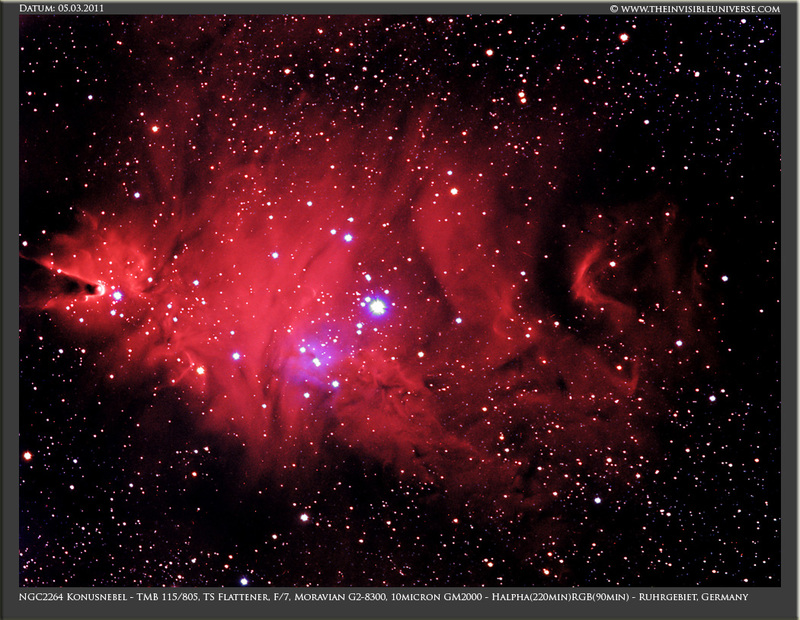 RGB: 6x360s 1x1, Baader 2" CCD-Filter. ASA 10N, f=910mm at f3.6. 10micron GM2000 mount. Guiding with a self made off-axis guider for the Wynne-Corrector and a Starlight XPress Lodestar. Moravian G2-8300FW cooled CCD camera. Location: Ruhrgebiet, Germany. This is the open star cluster M44, also called Beehive or Praesepe cluster, in the constellation of cancer. Its distance is about 610 light years and contains an estimated 1000 young stars of an average age of 500 millions years. It is suspected that this cluster formed in the same interstellar cloud with the Hyades cluster in Taurus. RGB: 5x360s 1x1, Baader 2" CCD-Filter. ASA 10N, f=910mm at f3.6. 10micron GM2000 mount. Guiding with a self made off-axis guider for the Wynne-Corrector and a Starlight XPress Lodestar. Moravian G2-8300FW cooled CCD camera. Location: Ruhrgebiet, Germany. 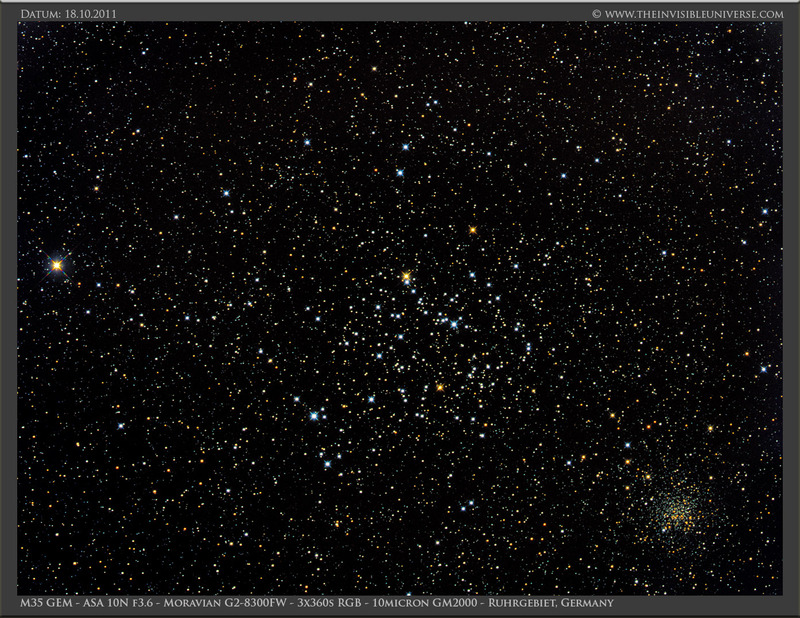 The open star cluster M35 and the globular cluster NGC2158 in Gemini. M35 looks more bluish, containing young stars in about 2800 light years distance. The stars in NGC2158 are old and red and 6x farther away than M35. 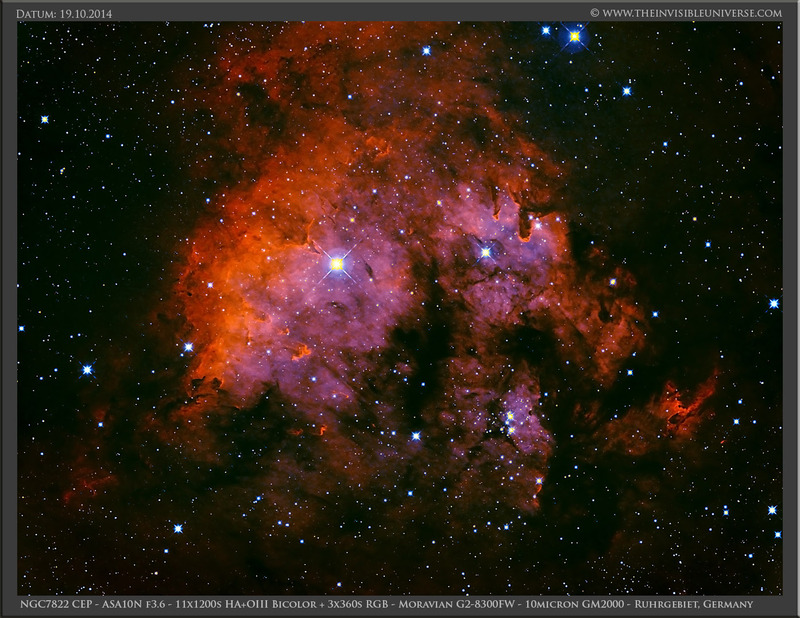 RGB: 3x360s 1x1, Baader 2" CCD-Filter. ASA 10N, f=910mm at f3.6. 10micron GM2000 mount. Guiding with a self made off-axis guider for the Wynne-Corrector and a Starlight XPress Lodestar. Moravian G2-8300FW cooled CCD camera. Location: Ruhrgebiet, Germany. IC410, also called the tadpole nebula in the constellation of Auriga. 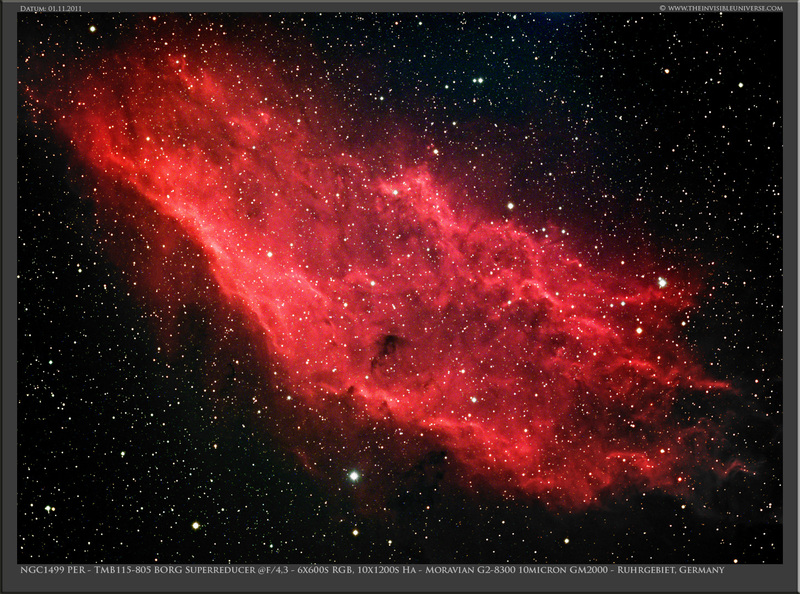 I used Ha+OIII Bicolor frames with a synthetic green channel, enhanced by RGB frames for star couloirs. 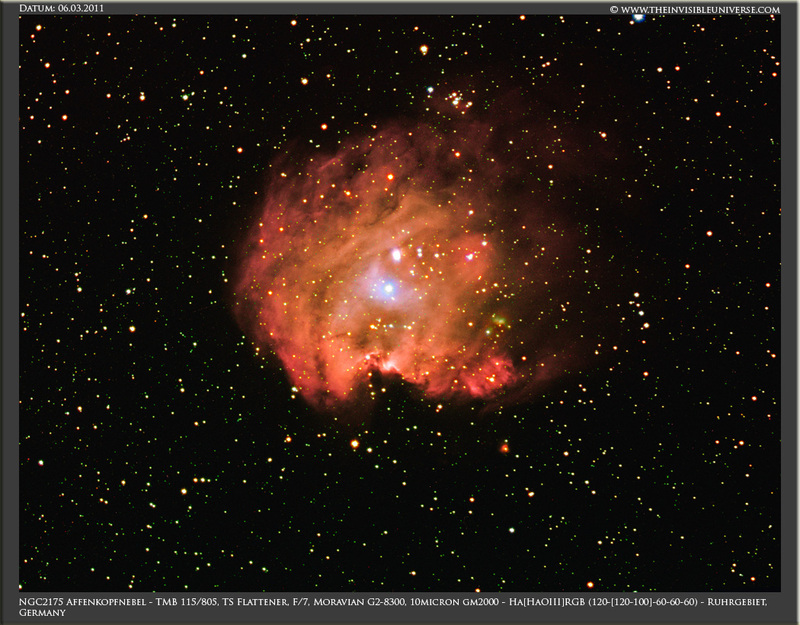 There are at least to of those tadpole visible, leftovers of the star formation of the young cluster NGC1893 within the nebula. The intense UV radiation pressure causes the tails of the tadpoles pointing away from the cluster. Ha: 19x1200s 1x1, OIII 17x1200s 1x1, RGB: 3x360s each. Baader 2" CCD-Filter. ASA 10N Astrograph, 910mm at f3.6. 10micron GM2000. Guiding with a self made off-axis guider for the Wynne-Corrector and a Starlight XPress Lodestar. Moravian G2-8300FW cooled CCD camera. Location: Ruhrgebiet, Germany. 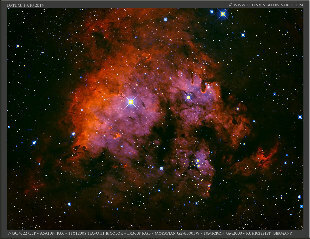 NGC7822 in the constellation of Cepheus. 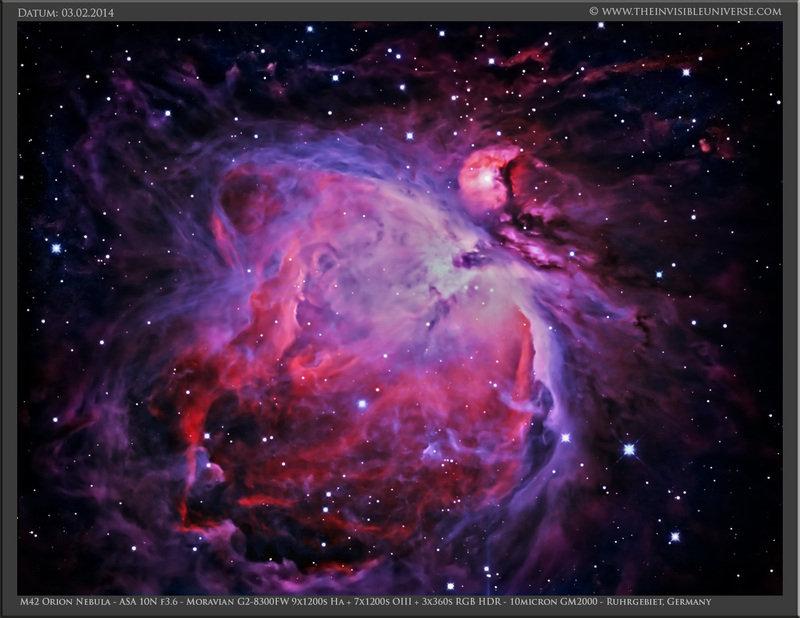 I used Ha+OIII Bicolor frames with a synthetic green channel, enhanced by RGB frames for star couloirs. This emission nebula has a couple of features that are known by the name "pillars of creation", popular by the famous Hubble picture of the eagle nebula. This are regions were proto star formation is going on. Ha: 11x1200s 1x1, OIII 11x1200s 1x1, RGB: 3x360s each. Baader 2" CCD-Filter. ASA 10N Astrograph, 910mm at f3.6. 10micron GM2000. Guiding with a self made off-axis guider for the Wynne-Corrector and a Starlight XPress Lodestar. Moravian G2-8300FW cooled CCD camera. Location: Ruhrgebiet, Germany. 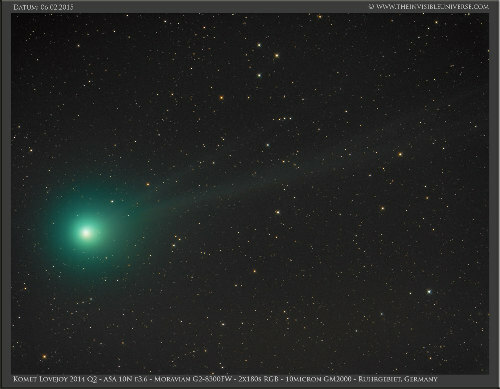 Comet Lovejoy 2014 Q2 was a real surprise in terms of brightness and visibility. Discovered only in August 2014 by Terry Lovejoy this comet could be spotted by the naked eye after sunset - darks skies provided. After a long period of bad weather and bright moon I was able to catch the comet on CCD on Friday, February 6, 2015 by 7 p.m. As the comet moves rather quickly against the starry background, only a short exposure set of images could be stacked. 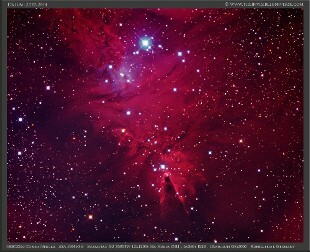 RGB: 2x180s 1x1, Baader 2" CCD-Filter. ASA 10N, f=910mm at f3.6. 10micron GM2000 mount. Guiding with a self made off-axis guider for the Wynne-Corrector and a Starlight XPress Lodestar. Moravian G2-8300FW cooled CCD camera. Location: Ruhrgebiet, Germany. This is the well known Galaxy pair M81 and the Starburst Galaxy M82 in the constellation of Ursus Major. In M82 the Type Ia Supernova SN 2014J is visible. The location of the Supernova is marked with a red arrow. 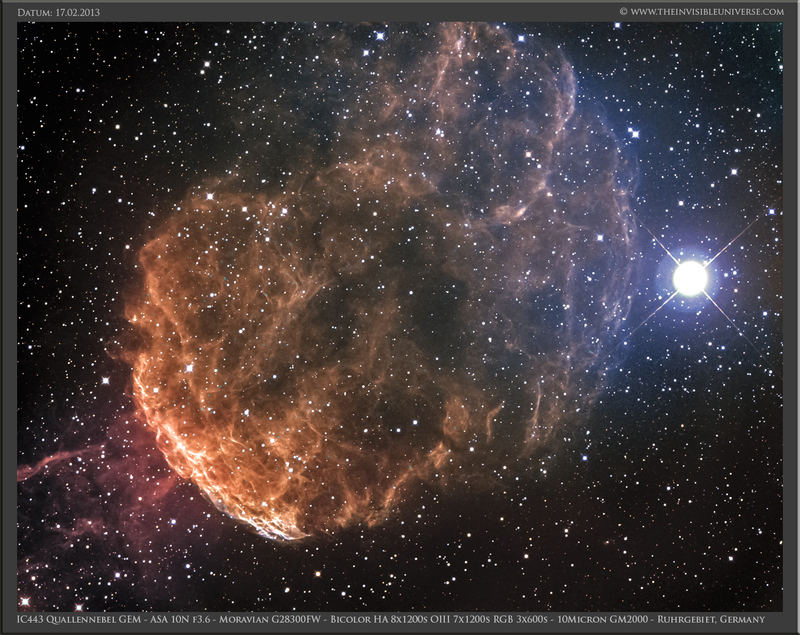 This shot was made mid of March when the Supernova had already passed its peak brightness. The distance of M82 is approximately 12 million light years. This is one of the closest supernovae to earth observed in recent decades. The total exposure time is 3 hours. UHC: 20x360s 1x1, RGB: 3x360s each. Baader 2" CCD-Filter. ASA 10N Astrograph, 910mm at f3.6. 10micron GM2000. Guiding with a self made off-axis guider for the Wynne-Corrector and a Starlight XPress Lodestar. Moravian G2-8300FW cooled CCD camera. Location: Ruhrgebiet, Germany. 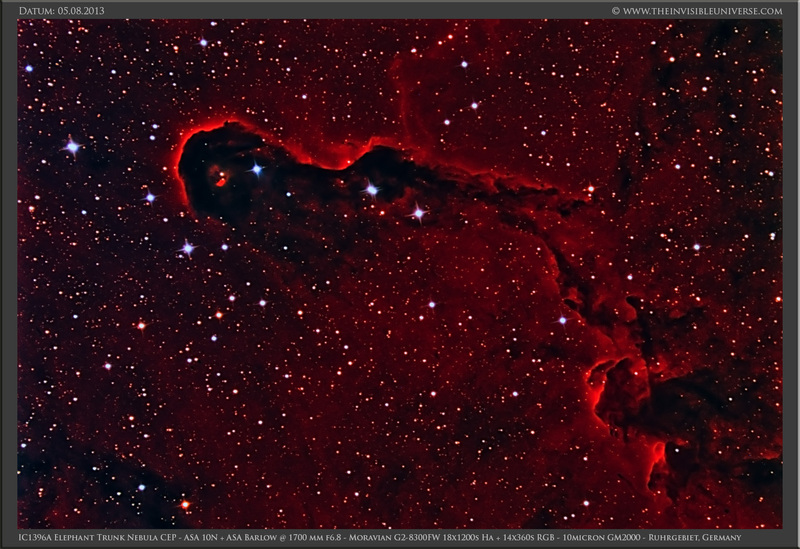 IC1396A or the Elephant Trunk Nebula in the constellation of Cepheus. 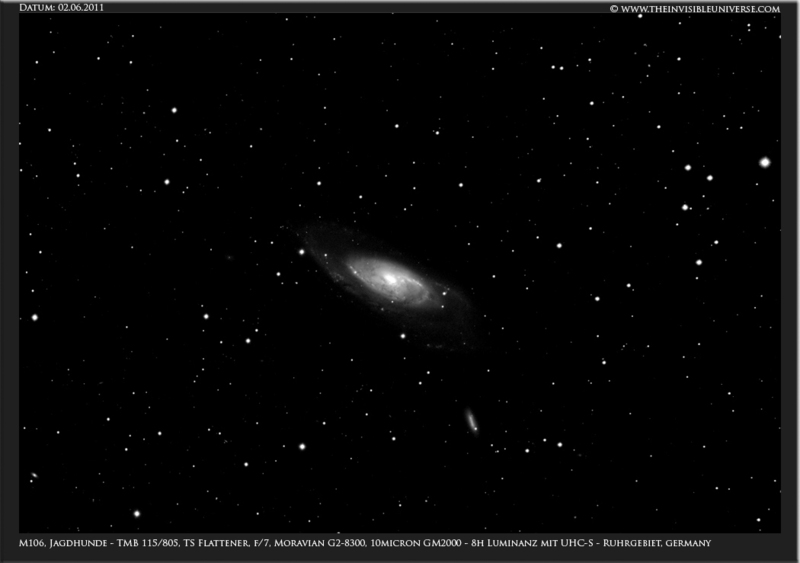 This one is shot with the ASA Barlow on the ASA 10N Astrograph at f6.8. I used Ha enhanced by RGB frames for star couloirs and the small blue reflection nebula, which is unfortunately not very good visible. The total exposure time is 10 hours! Ha: 18x1200s 1x1, RGB: 14x360s each. Baader 2" CCD-Filter. ASA 10N Astrograph, 910mm at f3.6. 10micron GM2000. Guiding with a self made off-axis guider for the Wynne-Corrector and a Starlight XPress Lodestar. Moravian G2-8300FW cooled CCD camera. Location: Ruhrgebiet, Germany. NGC2264 Conus Nebula in the constellation of Monoceros. I used Ha, Hbeta and OIII narrowband filters, enhanced by RGB frames for star couloirs and the small blue reflection nebula. Image processing was quite a struggle due to the sky brightness of the southern horizon caused by the city lights of the Ruhrgebiet. The total exposure time is 7.5 hours! Ha, Hbeta, OIII: 12x1200s 1x1 each, RGB: 6x360s 1x1 each. Baader 2" CCD-Filter. ASA 10N Astrograph, 910mm at f3.6. 10micron GM2000. Guiding with a self made off-axis guider for the Wynne-Corrector and a Starlight XPress Lodestar. Moravian G2-8300FW cooled CCD camera. Location: Ruhrgebiet, Germany. This is the well know great Orion nubble in the constellation of Orion, Messier 42. I could not gather much light as the weather in Germany is not the best for astrophotography during the winter season 2013/2014 and as I only have a narrow region of the sky between two large trees were I can watch Orion for about 3 hours each night. 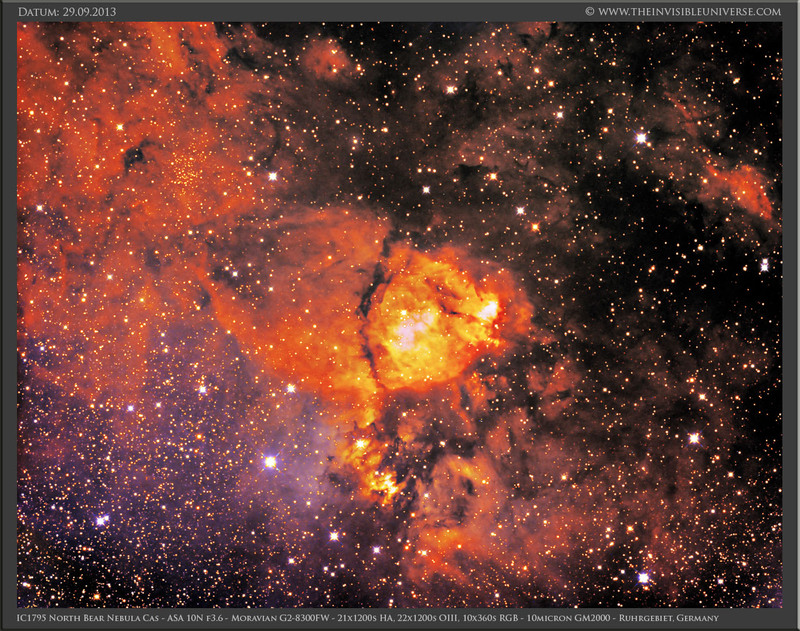 Nevertheless, I tried to bring out the outer dim regions of the nebula, which fade into the bright sky background lit by the city lights of the Ruhrgebiet, without loosing the central bright region by using HDR technique of Photoshop. I used Ha+OIII Bicolor frames with a synthetic green channel, enhanced by RGB frames for star couloirs. Ha: 9x600s 1x1 + 5x60s, OIII 7x1200s 1x1 + 5x60s, RGB: 3x360s each. Baader 2" CCD-Filter. ASA 10N Astrograph, 910mm at f3.6. 10micron GM2000. Guiding with a self made off-axis guider for the Wynne-Corrector and a Starlight XPress Lodestar. Moravian G2-8300FW cooled CCD camera. Location: Ruhrgebiet, Germany. 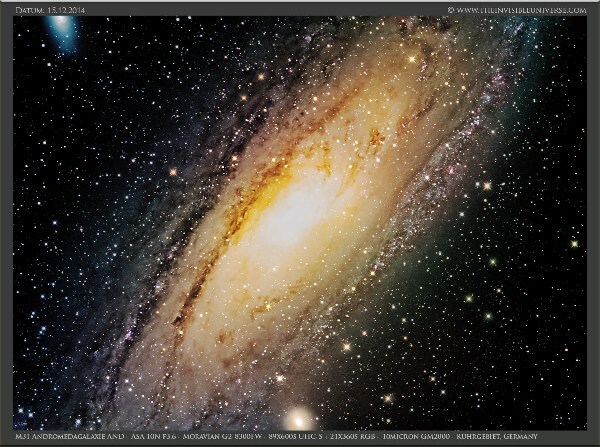 The Andromeda Galaxy M31. Generally, the greenish hue of the bright light polluted sky background of the observation place makes it very difficult the work out all the structures of the galaxy and maintaining the correct colour, although I used a UHC-Filter to reduce background light. 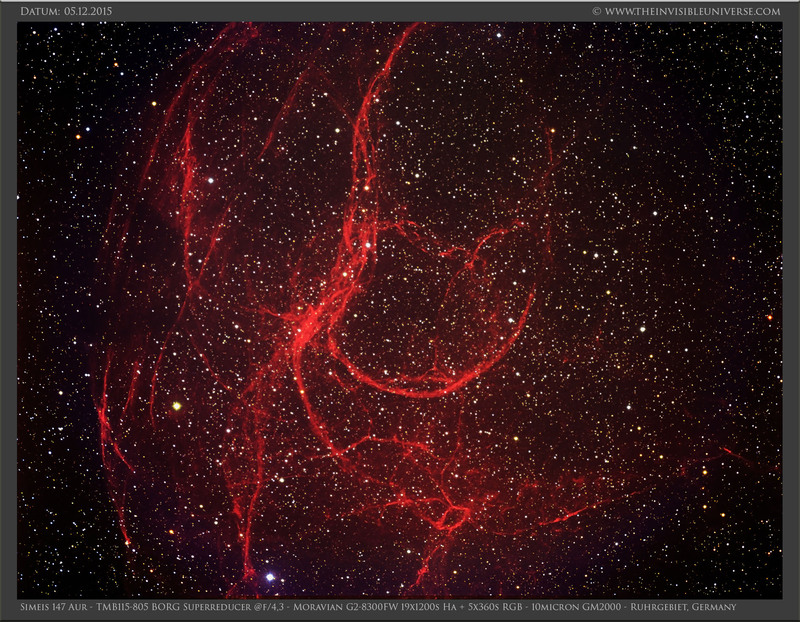 Furthermore, the very bright central part of the galaxy needs some attention in terms of HDR processing in Photoshop. I used the HDR filter, high pass filtering and unsharp masking to enhance the structures of the galaxy, and a additional colored layer to reduce the green hue of the sky background. Luminance UHC-S 40x600s 1x1, RGB: 12x360s each. 10h of total exposure time. Baader 2" CCD-Filter. ASA 10N Astrograph, 910mm at f3.6. 10micron GM2000. Guiding with a self made off-axis guider for the Wynne-Corrector and a Starlight XPress Lodestar. Moravian G2-8300FW cooled CCD camera. Location: Ruhrgebiet, Germany. NGC6543 Catseye Nebula in the constellation of Draco. 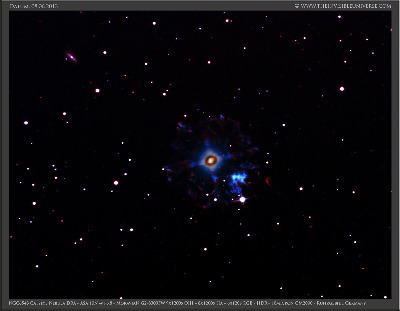 This planetary nebula has a dim outer envelope of hydrogen gas with OIII and Ha emission. 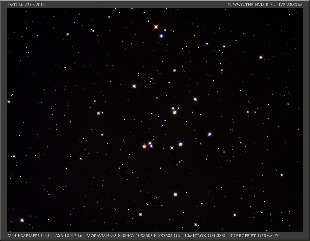 The challenge to make visible the bright inner part and the outer dim areas is the HDR image processing in Photoshop. 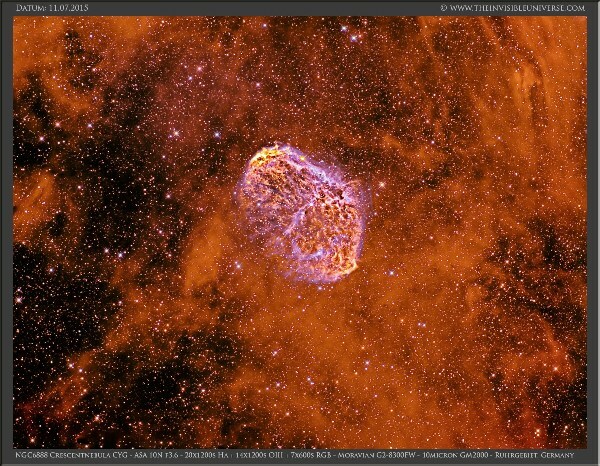 I tried to show both parts of the nebula despite its very different brightness by using 32bit image processing and HDR techniques to combine narrowband bicolor files for both the inner ring and the outer envelope. Again the ASA 10N Astrograph demonstrated its versatility as I used the ASA barlow lens to extend the focal range up to 1700mm at f6.8. Ha: 8x1200s 1x1, 9x1200s OIII 1x1, RGB: 4x600s 1x1 each. Baader 2" CCD-Filter. ASA 10N Astrograph with ASA Barlow and 1700mm at f6.8. 10micron GM2000. Guiding with a self made off-axis guider for the Wynne-Corrector and ASA Barlow, and a Starlight XPress Lodestar. Moravian G2-8300FW cooled CCD camera. Location: Ruhrgebiet, Germany. 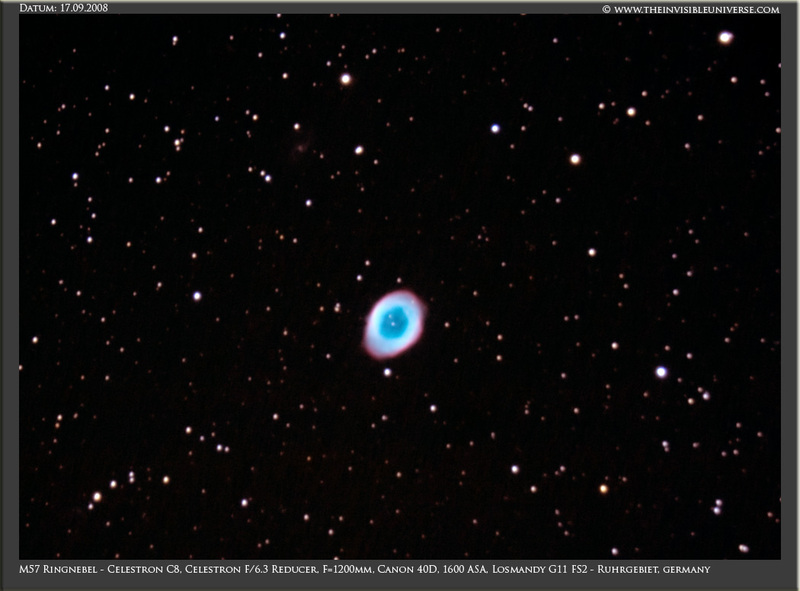 This is the well know Ring Nebula M57 in the constellation Lyra. 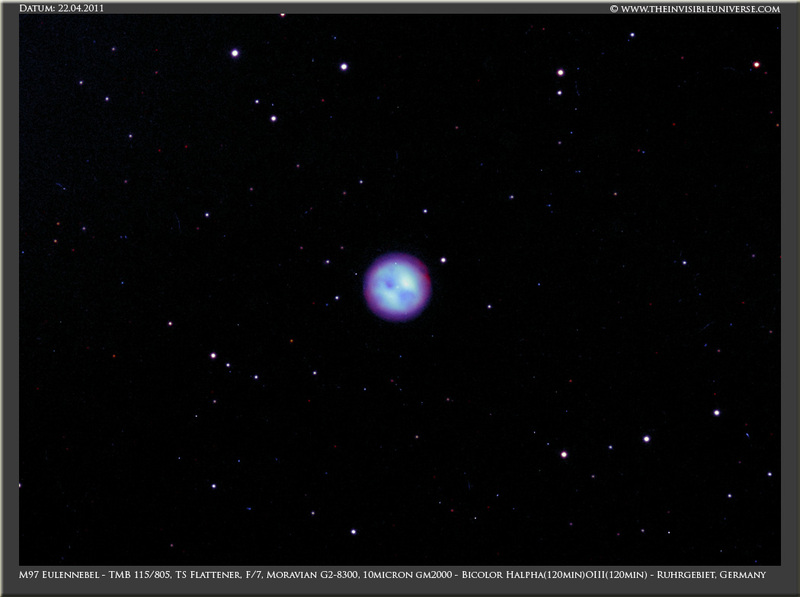 This planetary nebula has a dim outer envelope of hydrogen gas with Ha emission. 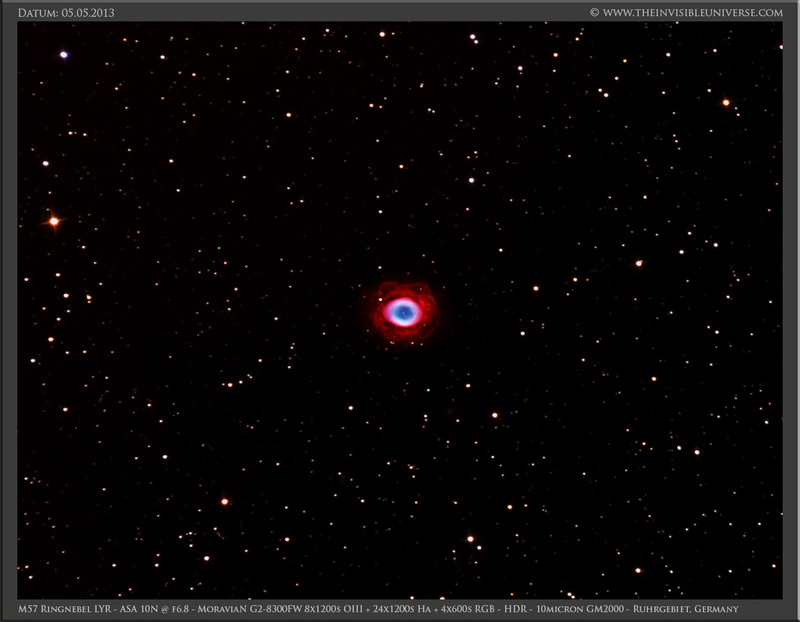 The challenge to make visible the bright inner part and the outer dim areas is the HDR image processing in Photoshop. I tried to show both parts of the nebula despite its very different brightness by using 32bit image processing and HDR techniques to combine RGB files for the inner ring and Ha for the outer envelope. Again the ASA 10N Astrograph demonstrated its versatility as I used the ASA barlow lens to extend the focal range up to 1700mm at f6.8. Ha: 24x1200s 1x1, RGB: 4x600s each. Baader 2" CCD-Filter. ASA 10N Astrograph with ASA Barlow and 1700mm at f6.8. 10micron GM2000. Guiding with a self made off-axis guider for the Wynne-Corrector and ASA Barlow, and a Starlight XPress Lodestar. Moravian G2-8300FW cooled CCD camera. Location: Ruhrgebiet, Germany. 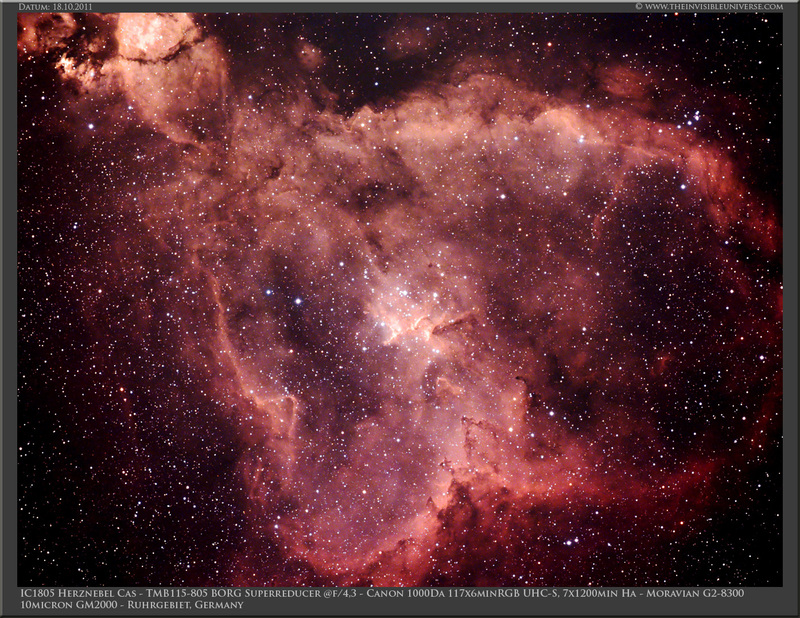 IC1795 North Bear Nebula in the constellation of Cassiopeia. 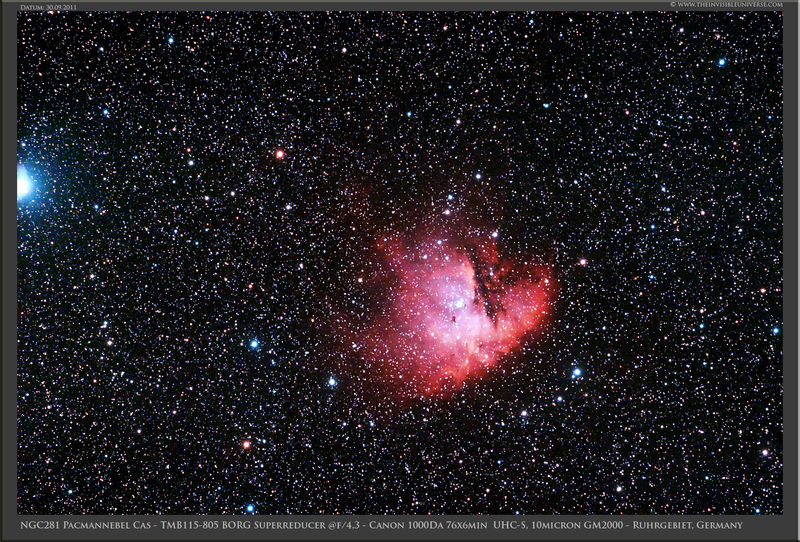 This nebula is part of the well known Heart Nebula and lies in the Perseus arm of the Milky Way, some 7000 LJ away. 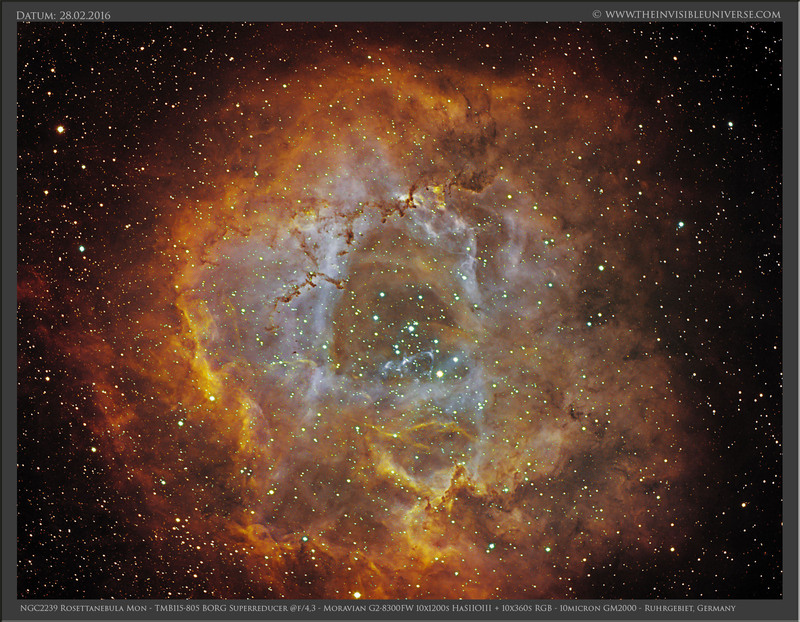 7h of exposure in Ha and OIII respectively, and 1h RGB each with the ASA 10N Astrograph and the ASA Wynne corrector at f3.6 gives a total exposure time of 17h! This is the longest exposure time of one object I have currently obtained. Although not perfect, the image processing in Photoshop reveals the complex structure of the Ha and OIII regions. The blueish reflexion nebula is not well visible due to the massive light pollution of my observation area. Ha: 21x1200s 1x1, OIII 22x1200s 1x1, RGB: 10x360s each. Baader 2" CCD-Filter. ASA 10N Astrograph, 910mm at f3.6. 10micron GM2000. Guiding with a self made off-axis guider for the Wynne-Corrector and a Starlight XPress Lodestar. Moravian G2-8300FW cooled CCD camera. Location: Ruhrgebiet, Germany. 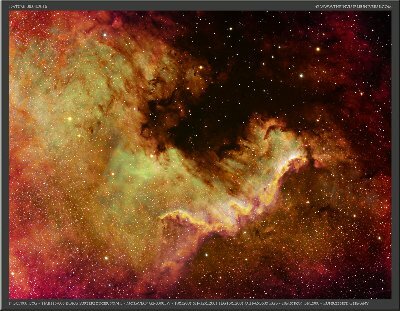 NGC7380 or Wizard Nebula in Cepheus. 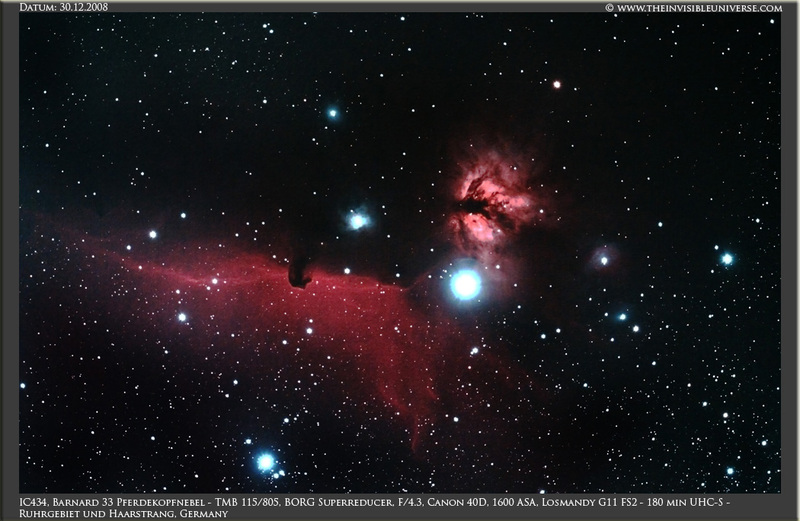 5h of exposure in Ha and 1h RGB each with the ASA 10N Astrograph and the ASA Wynne corrector at f3.6. Ha: 15x1200s 1x1, RGB: 10x360s each. Baader 2" CCD-Filter. ASA 10N Astrograph, 910mm at f3.6. 10micron GM2000. Guiding with a self made off-axis guider for the Wynne-Corrector and a Starlight XPress Lodestar. Moravian G2-8300FW cooled CCD camera. Location: Ruhrgebiet, Germany. 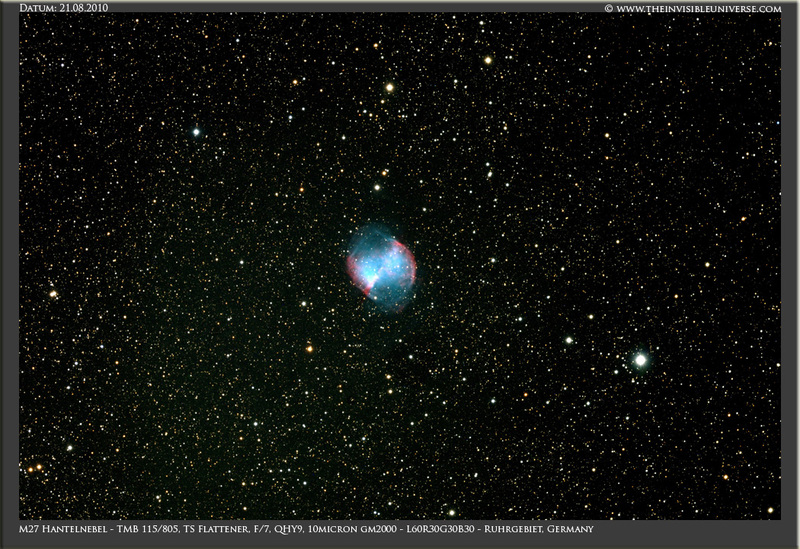 M27 is a classical deep sky object of the summer starry sky. I tried to image the very dim outer parts of this planetary nebula in Ha without sacrificing the much brighter inner part. The bright sky background made this not easy. 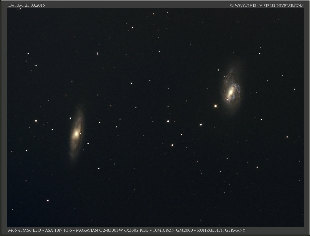 Over 5h of exposure in Ha with the ASA 10N Astrograph and the ASA barlow lens at f6.8 and 1700 mm focal length were necessary. 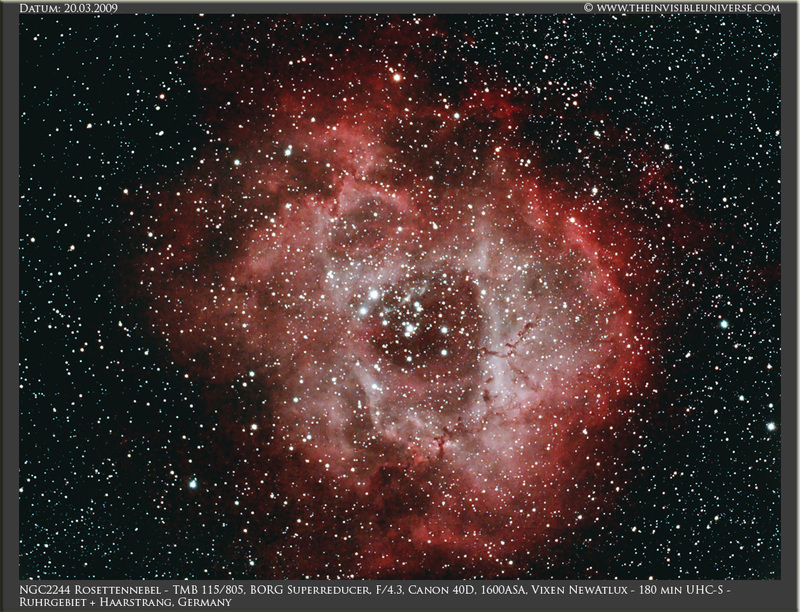 The ASA barlow lens is a good tool to extend the focal range of this fast Astrograph. Ha: 16x1200s 1x1, RGB: 10x360s each. Baader 2" CCD-Filter. ASA 10N Astrograph, 1700mm at f6.8. 10micron GM2000. Guiding with a self made off-axis guider for the Wynne-Corrector and a Starlight XPress Lodestar. Moravian G2-8300FW cooled CCD camera. Location: Ruhrgebiet, Germany. 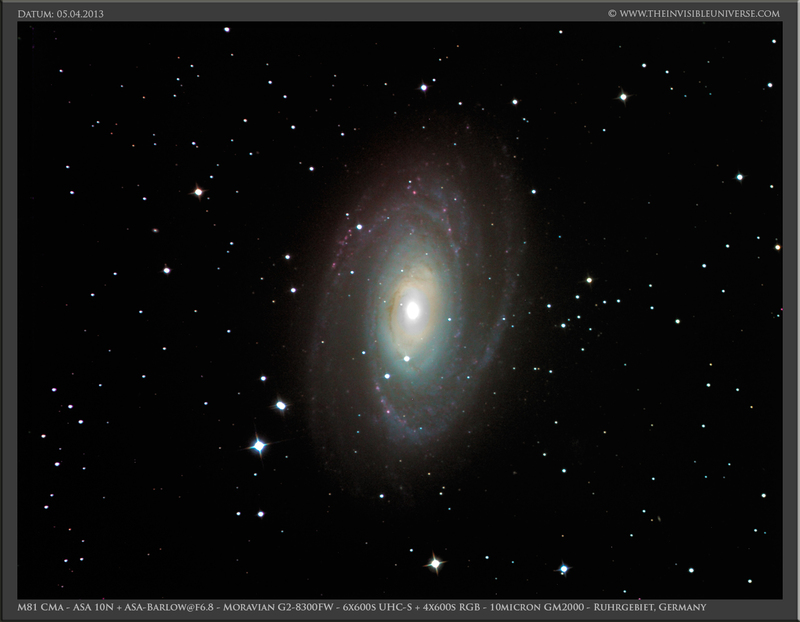 The large and nearby Galaxy M81 in the constellation of Canis Majoris is probably one of the most impressive Galaxies in the sky. 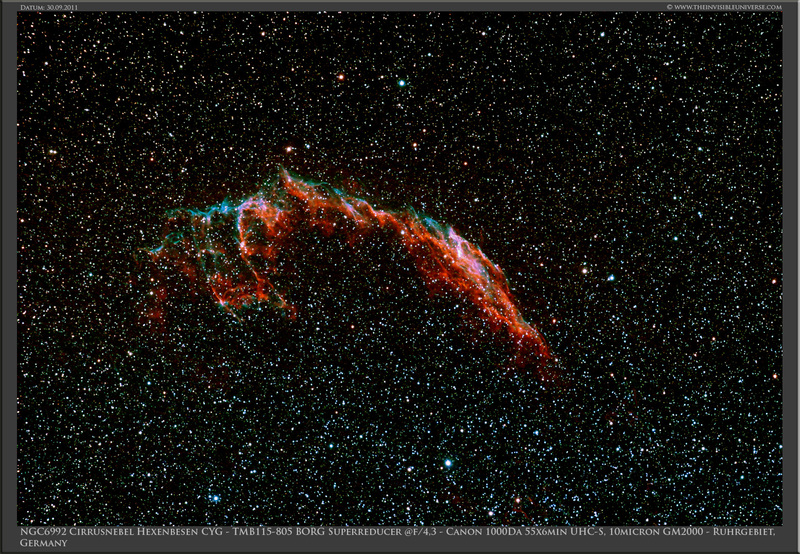 I shot this one in L-RGB with 70 min UHC-S and 40min RGB each. The sky pollution is very high and therefore the outer parts of the Galaxy are nearly invisible and colour correction is challenging. As the weather conditions in Germany were really bad the whole winter from November 2012 through March 2013 I had not many nights for collecting photons. UHC-S: 7x600s 1x1, RGB: 4x600s each. Baader 2" CCD-Filter. ASA 10N Astrograph, 1700mm at f6.8. 10micron GM2000. Guiding with a self made off-axis guider for the Wynne-Corrector and a Starlight XPress Lodestar. Moravian G2-8300FW cooled CCD camera. Location: Ruhrgebiet, Germany. This is IC443 Jellyfish Nebula (Quallennebel) in the constellation of Geminorum. 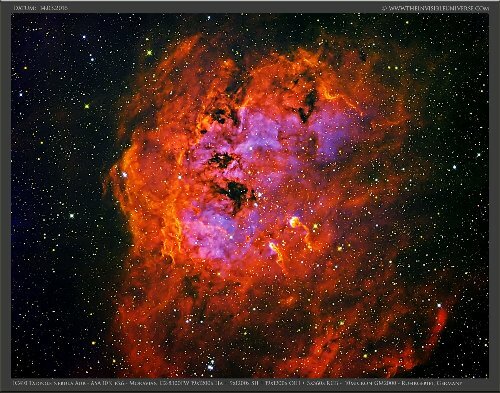 I shot this one in bicolor technique with 160 min Ha and 140 min OIII and added 30 min of RGB each to have more realistic star colours. Due to the very weak OIII signal and the light pollution the S/N could be better. As the weather conditions in Germany were really bad the whole winter from November 2012 through March 2013 I had not many nights for collecting photons. The colour workflow has been done in Photoshop with the aid of the layer mask technique. I used the first time Adobe Camera Raw 4.3 for noise reduction in my Photoshop workflow as the noise reduction tool in Camera Raw is better than in Photoshop. Further I used the Camera RAW local healing brush to enhance contrast, colour etc. in some of the areas in the image. Halpha: 8x1200s 1x1, OIII: 7x1200s, red: 3x600s 1x1, green: 3x600s 1x1, blue: 3x600s 1x1. Baader 2" CCD-Filter. ASA 10N Astrograph, 910mm at f3.6. 10micron GM2000. Guiding with a self made off-axis guider for the Wynne-Corrector and a Starlight XPress Lodestar. Moravian G2-8300FW cooled CCD camera. Location: Ruhrgebiet, Germany. The Flaming Star Nebula,IC405, in the constellation of Auriga. I shot this with my new ASA 10N Astrograph at f3.6 with 9 hours of total integration time (5 hours integration time in RGB and over 4 h in Halpha). The camera is a Moravian G2-8300FW with 2" filters in order to avoid vignetting. 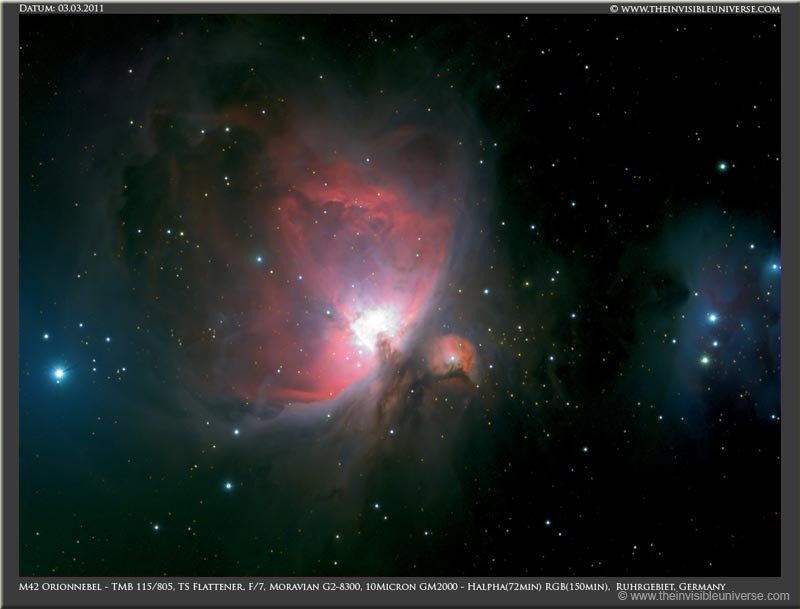 The heavy light pollution could be overcome with the use of a Ha narrowband filter. This image is made in Ha-RHaGB using layer masks in Photoshop. The red channel was mixed between red and Ha. Luminance was added by using Ha. Star colours were enhanced slightly by using masking technique. Halpha: 13x1200s 1x1, red: 8x600s 1x1, green: 8x600s 1x1, blue: 14x600s 1x1. Baader 2" CCD-Filter. ASA 10N Astrograph, 910mm at f3.6. 10micron GM2000. Guiding with a self made off-axis guider for the Wynne-Corrector and a Starlight XPress Lodestar. Moravian G2-8300FW cooled CCD camera. 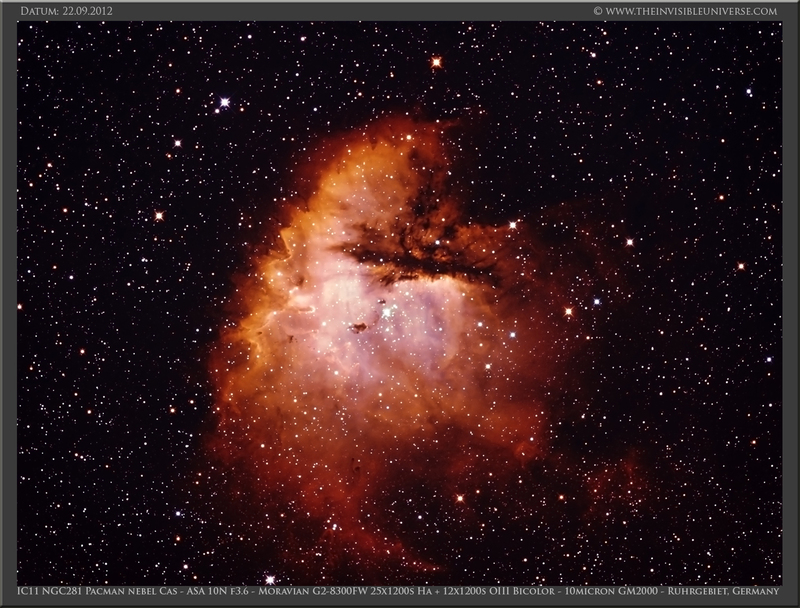 IC11 or NGC281, also called Pacman Nebula in Cassiopeia. 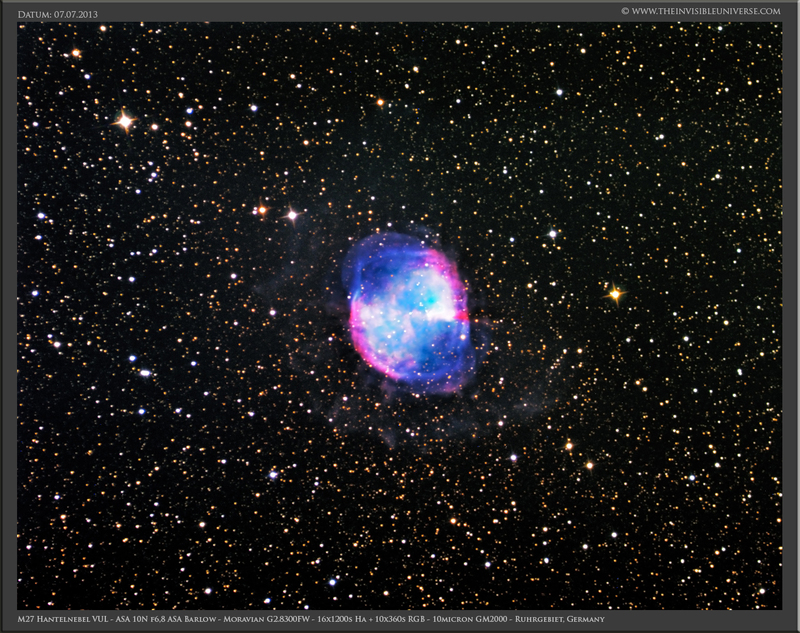 I shot this with my new ASA 10N Astrograph at f3.6 with over 6 hours of total integration time. The camera is a Moravian G2-8300FW with 2" filters in order to avoid vignetting. 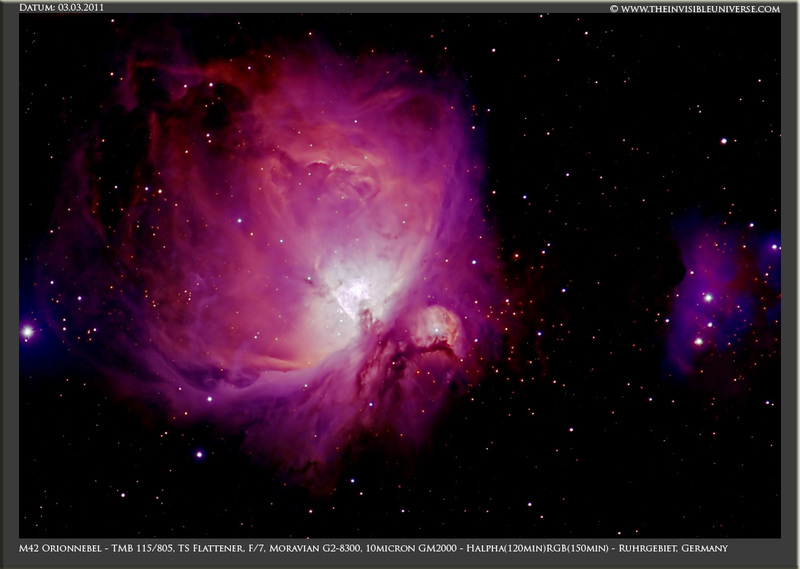 The heavy light pollution could be overcome with the use of Ha and OIII narrowband filters. This image is made in bicolor technique using layer masks in Photoshop. Halpha: 25x1200s 1x1, OIII: 12x1200s 1x1. Baader 2" CCD-Filter. ASA 10N Astrograph, 910mm at f3.6. 10micron GM2000. Guiding with a self made off-axis guider for the Wynne-Corrector and a Starlight XPress Lodestar. Moravian G2-8300FW cooled CCD camera. Halpha: 6x1200s 1x1, RGB: 3x600s 1x1 each. Baader CCD-Filter. ASA 10N Astrograph, 910mm at f3.6. 10micron GM2000. Off-Axis Guiding with the TSOAG9 and Starlight XPress Lodestar. Moravian G2-8300FW cooled CCD camera. 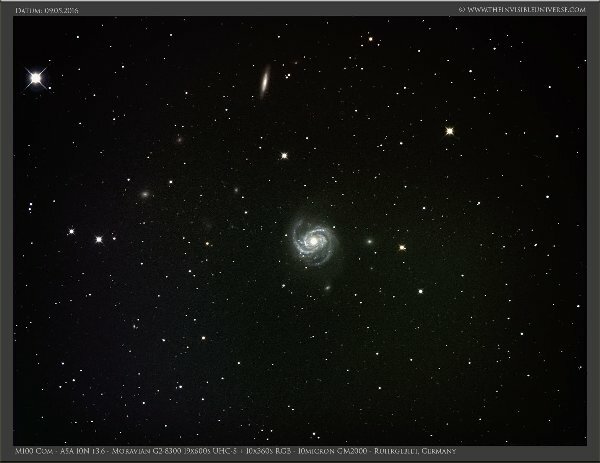 The following picture is Messier 51, shot with a modified TS Imaging Newton 10" f5 with a Baader MPCC Coma Corrector, an Off-Axis Guider and the Moravian G2-8300 CCD-camera Around 10 hours of exposure time where necessary to work out the dimmer parts of the Galaxy arms (48x600s UHC, 4x600s RGB, 5x1200s Halpha). However, heavy vignetting of the Newton due to a too small secondary mirror caused severe problems during image processing as even flats couldn't remove the vignetting. 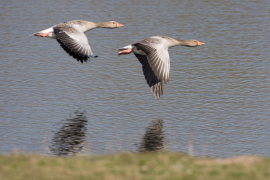 Hence the resulting image is not perfect in terms of image processing. I am sure: under dark skies a tenth of the exposure time would give similar results.